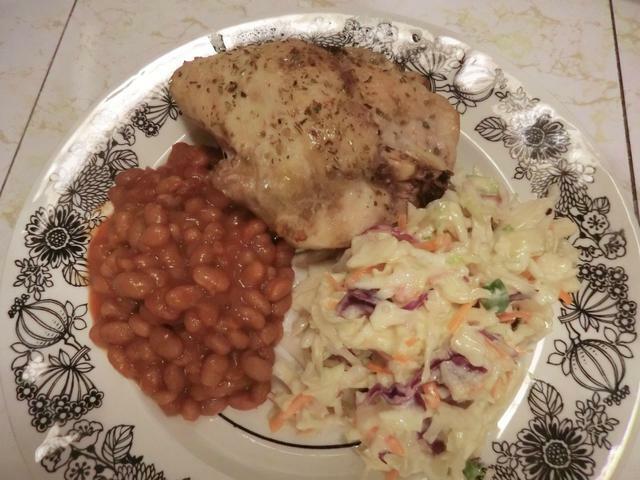 January | 2016 | Cooking is Fun … Really!! I’ve had a sushi craving for a while now, but the budget doesn’t allow for an outing as I’m saving up for b’day dim sum next weekend. So, I dug into my freezer (duh!) 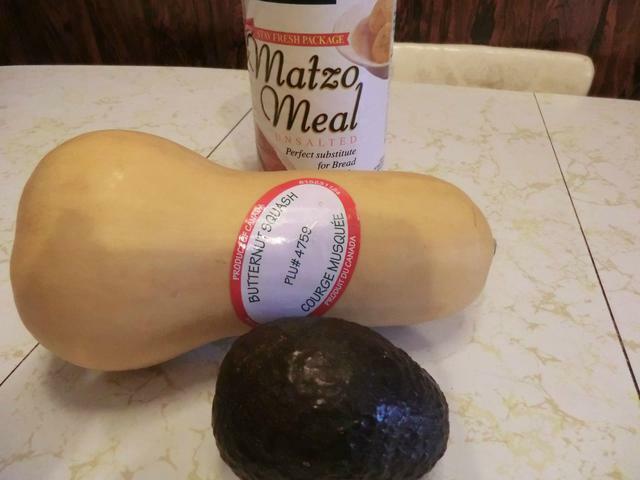 for a couple of ingredients. 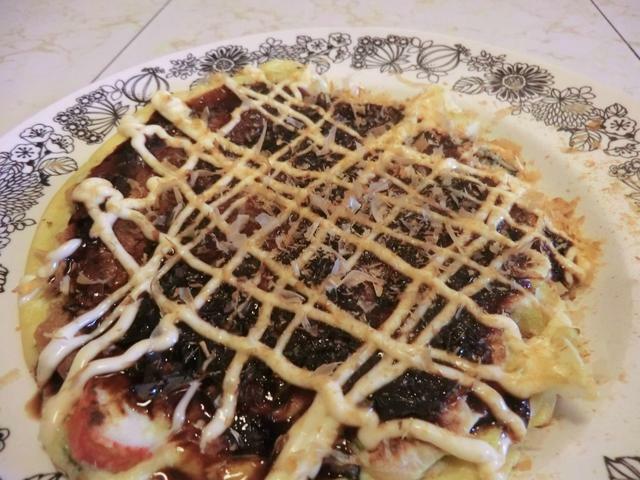 I started with a savoury pancake, okonomiyaki, which features shredded cabbage (I used a bagged coleslaw mix as a time-saver) and sliced surimi aka fake crab ‘legs’. 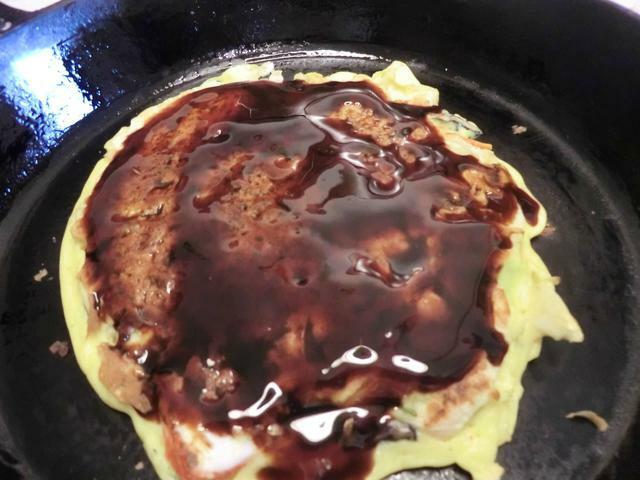 Instead of the sauce from the recipe, you can use bbq, tonkatsu or eel sauce, as I did. 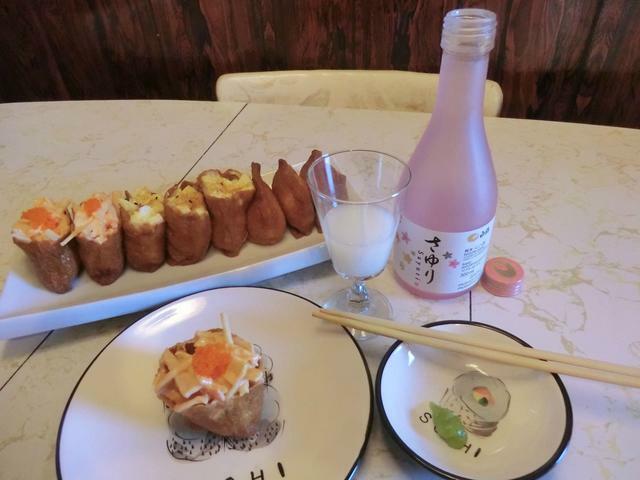 Following up with inari sushi, which are seasoned fried tofu pockets filled, traditionally with sushi rice. 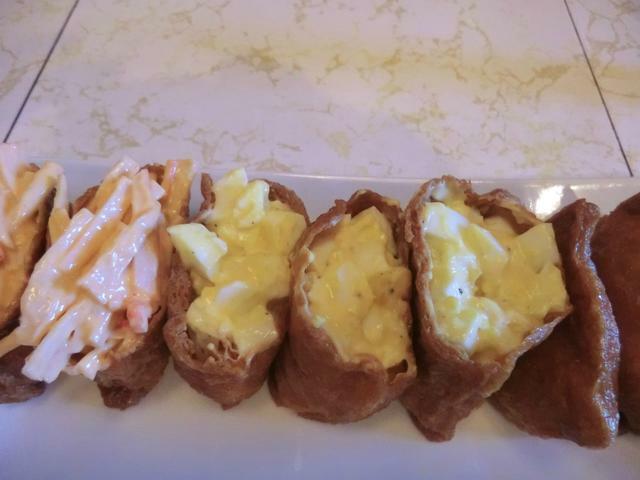 I topped them with spicy fake crab legs and egg salad. 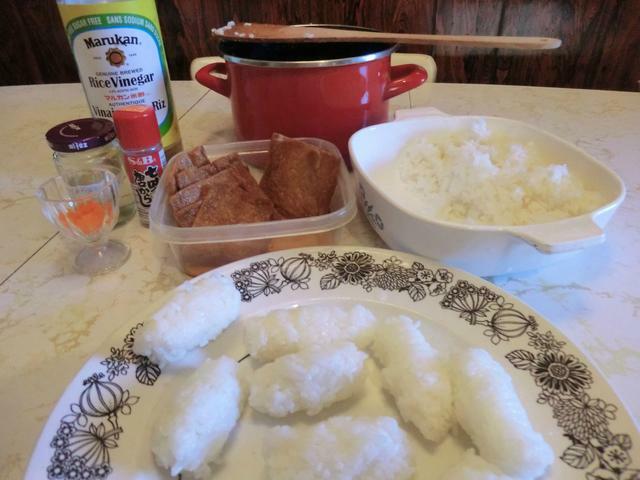 I was tempted to make a third topping of tuna salad but I’d made too much of the other two toppings for the leftover inari from the can which I’d frozen away. 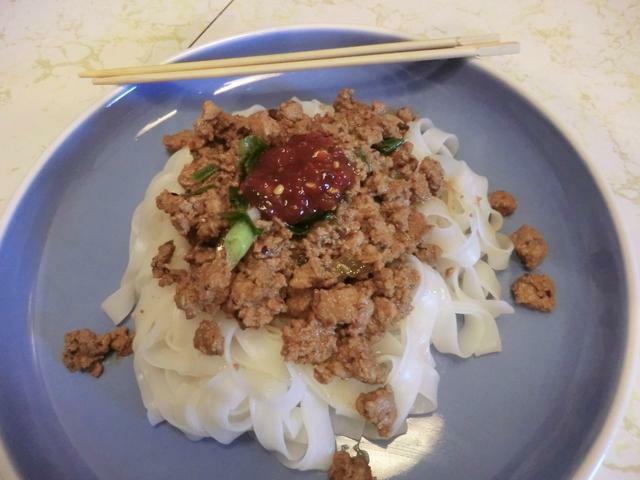 For an interesting and tasty variation, you can fill your tofu pockets with somen noodle salad. 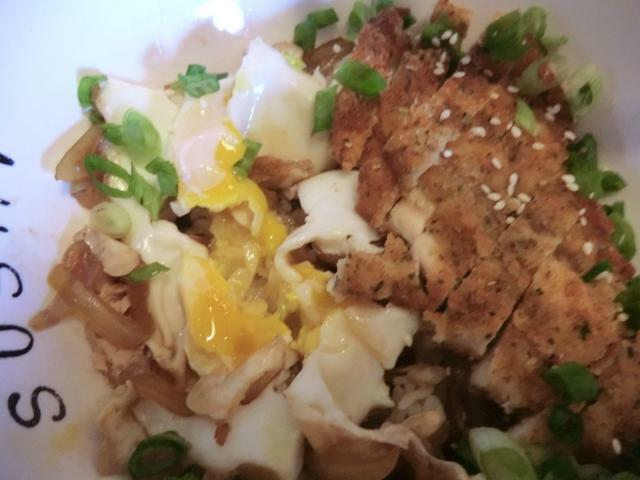 And since I had a couple of cups of leftover cooked sushi rice, I decided to make a donburi or rice bowl. 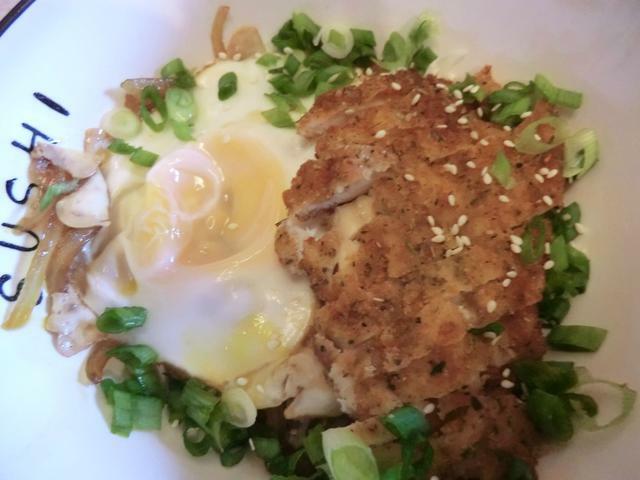 For a topping, I used one of the larger chicken cutlets/katsu made previously and an egg poached in the simmering sauce. 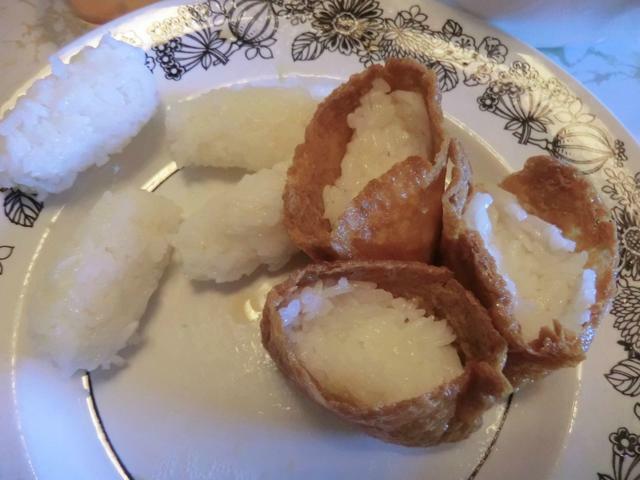 I only used 1 cup of the rice so I think I’ll freeze away the rest. 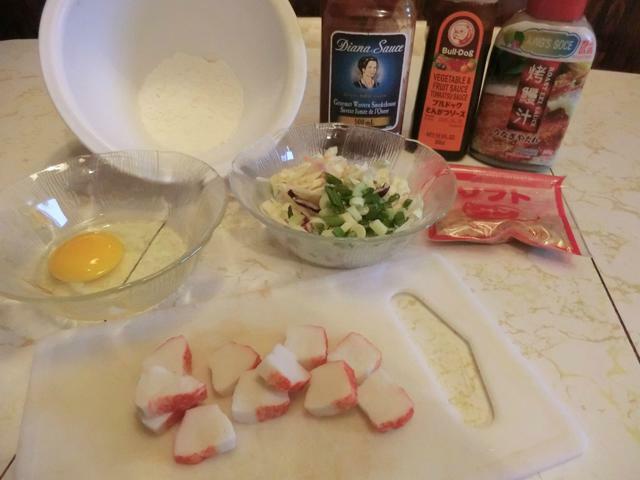 The only recipe you need is for the simmering sauce as the topping choices for the rice bowl are very flexible. 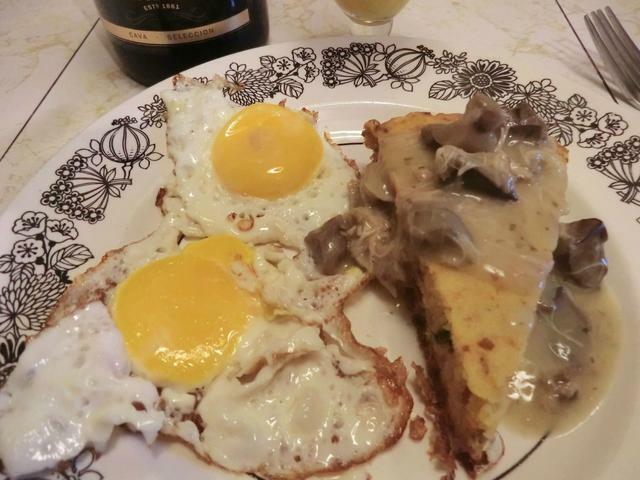 The egg stuck to the bottom of the pan while poaching so I lost a lot of the yolk to the simmering sauce. Oh well. What was there was still somewhat runny, the way I like it. Lest you think the last half of January was all about dessert and bread, I made a couple of pasta dishes this past weekend. I had 4 hot Italian sausages (~3/4 lb) in my freezer, along with most of a 2 kg bag of shucked clams. I was going to combine them in a tomato sauce to serve over pasta, then decided to go with a simple sausage/broccoli olive oil and garlic sauce instead. Then I changed my mind AGAIN and did both. 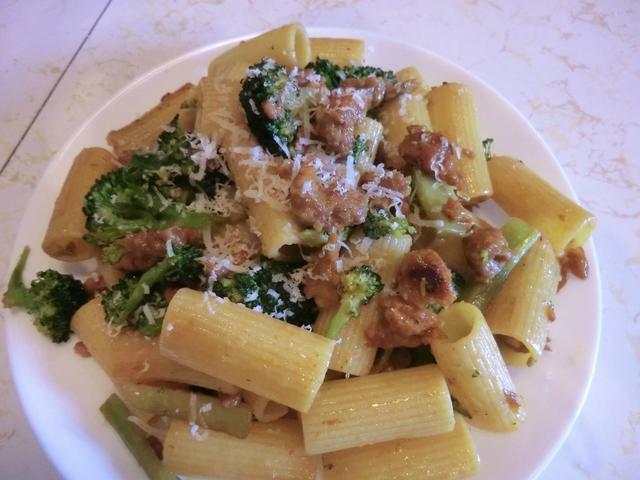 The sausage/broccoli (I also added some fennel seed and dry red chili pepper flakes to the sauce) was served over rigatoni pasta. 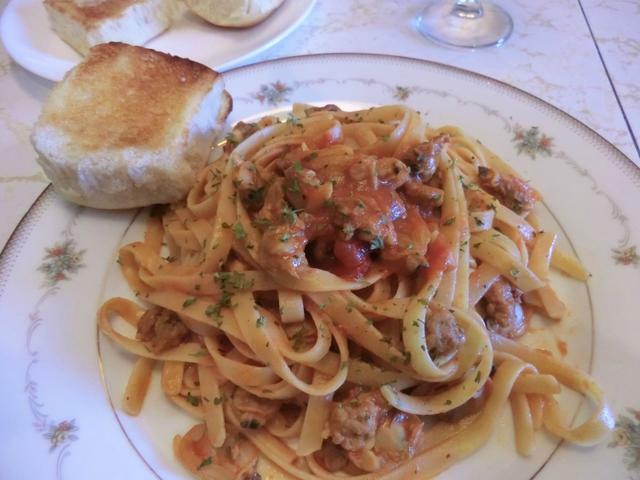 I combined half of the meat mixture with 1/2 pound of the clams and ~1 1/2 cups of a jarred Classico tomato and basil sauce and served it over fettuccine. If I’d had another couple of sausages, and another stalk of broccoli, I would have added it to the pan. 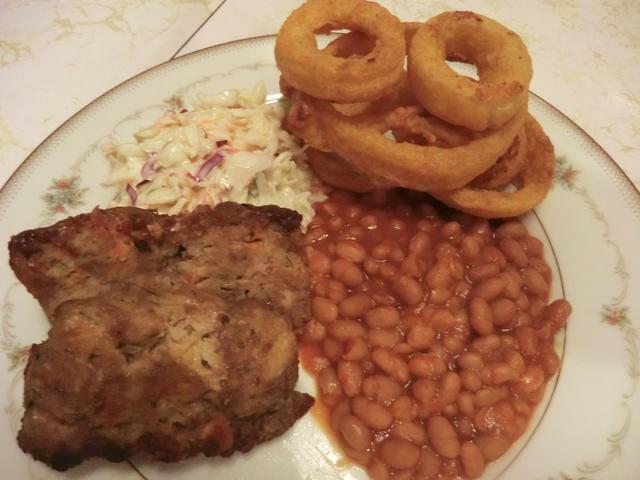 And there were some odds and end meals like this prime rib (from my British Christmas menu) on a pretzel bun with roasted potato wedges, onion rings (bought frozen) and Caesar salad. 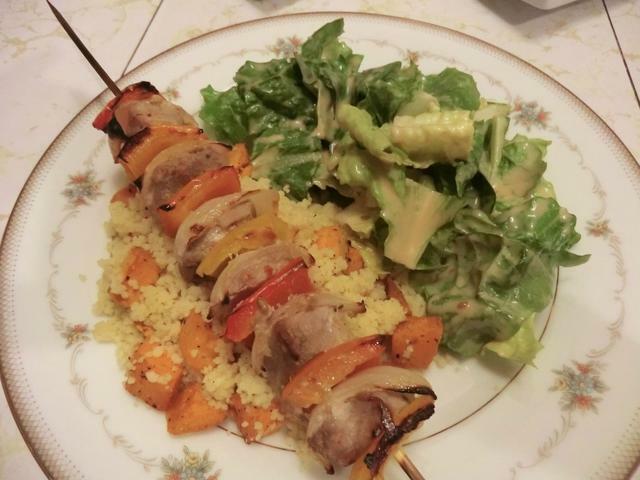 The last pork tenderloin (1 lb) in my freezer was cut up and turned into pork souvlaki and pork vindaloo. 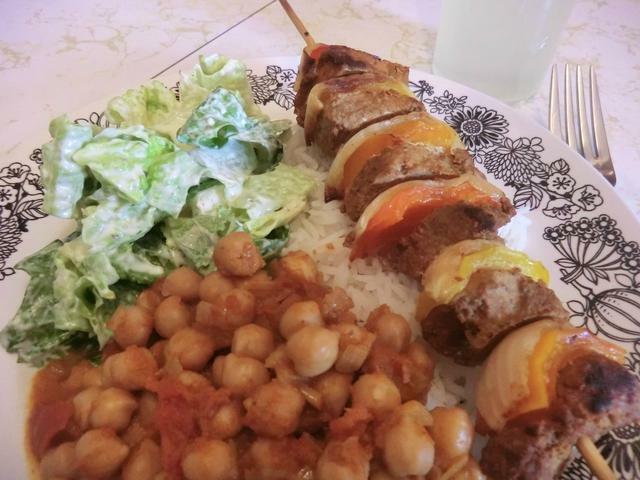 The souvlaki was served on couscous with roasted sweet potato while the vindaloo was served over basmati rice with chickpea curry. 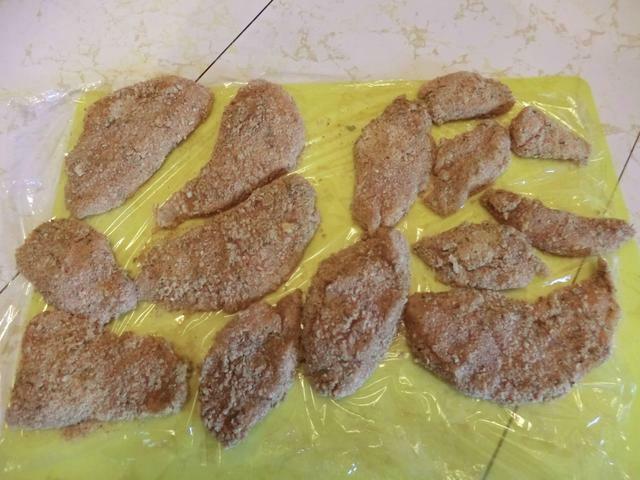 I was tempted by a sale on boneless skinless chicken breasts and bought six which I turned into cutlets and a bunch of chicken fingers. 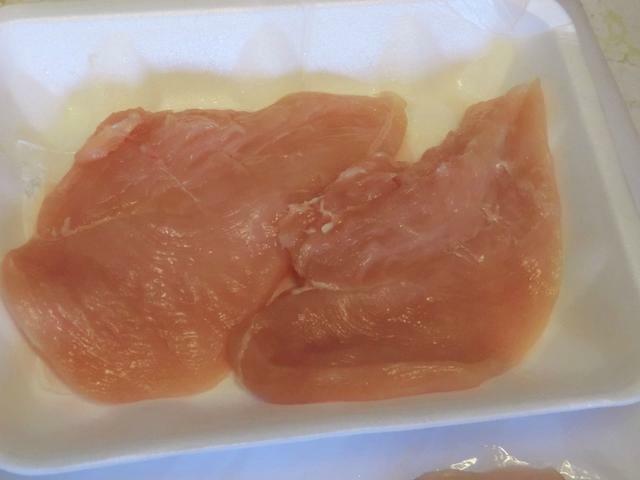 The cutlets were individually wrapped and frozen away. Some of the chicken fingers ended up in buns as sandwiches while a few more were part of a more complete meal. 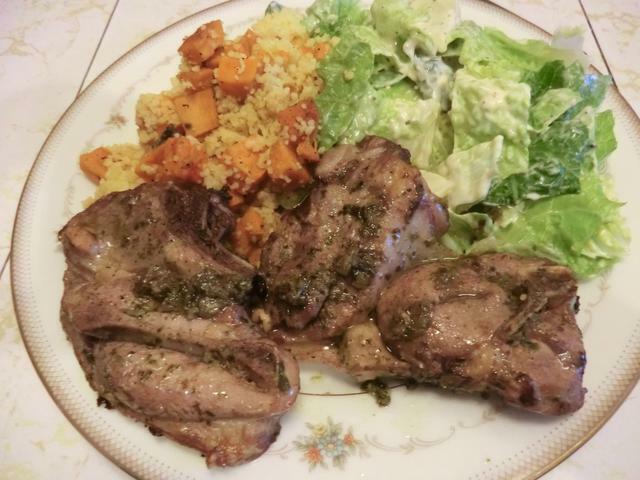 A couple of lamb shoulder chops (from a package of 6… I can’t resist a sale) were marinated with chimichurri butter and roasted for another tasty meal. I’ve got some Stilton cheese left over from my Christmas supper so I played with an idea for a cheese puff/gougere ring which could be cut in half and filled with chicken/turkey or shrimp/crab salad. 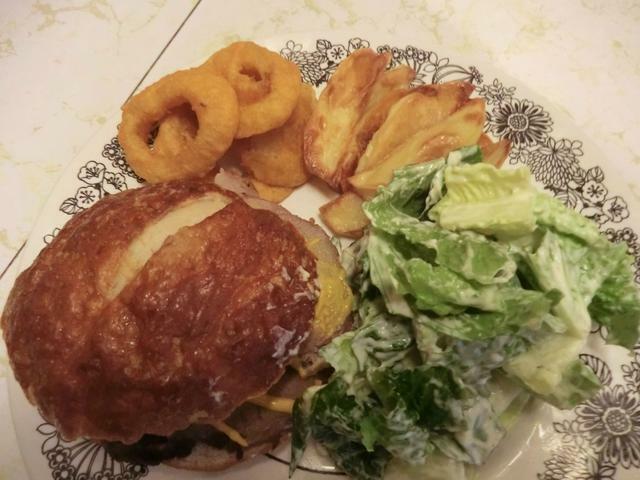 Unfortunately, the ring ended up resembling a relatively flat pull apart gougere ring. 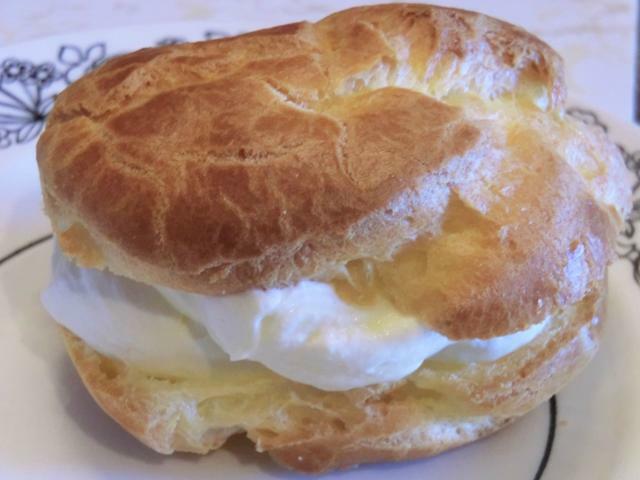 Next time, I add another egg to the choux pastry, spoon the choux pastry much close together or smoosh it together into a round. 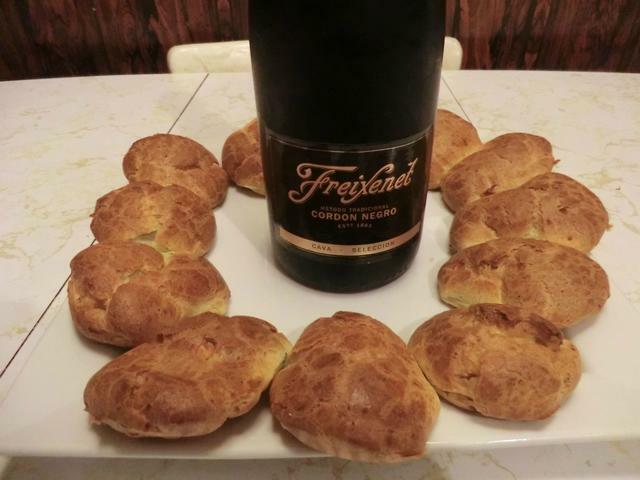 Still, the gougeres tasted good, especially eaten with some of the sparkling wine from New Year. I had enough wine left in the bottle to toss about 1/2 cup into the earlier sausage/clam tomato sauce I made this past weekend. But that was sheer coincidence, not good planning on my part. 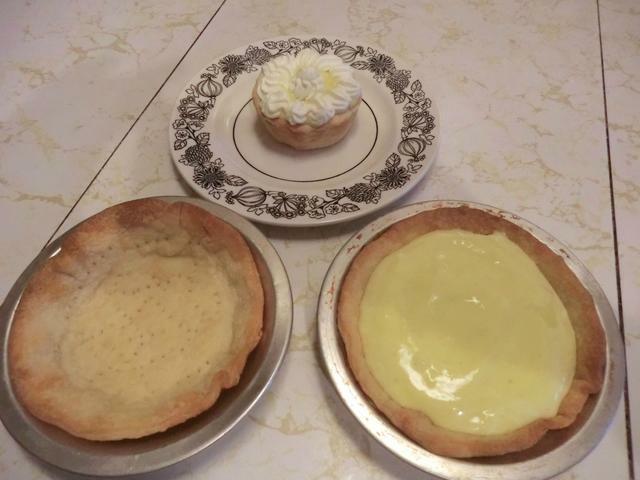 I made a batch of lemon curd early in January to use up some softening lemons from my fruit crisper drawer and, between the tarts (leftover pastry from the mincemeat tart bake), the sweet cream puffs filled with whipped cream mixed with the curd and just spooning it over ice cream, it’s all gone now. I think that about covers my January. I’ve been doing some more freezer diving lately as a way of keeping grocery costs down and because the frost layer is pretty thick and I really NEED to defrost the poor thing. 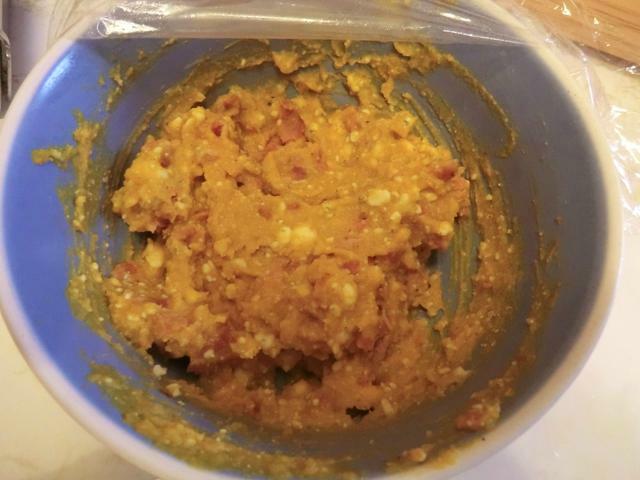 So, my recycled meals have been quick, tasty and filling (and, of course, economical) but not exactly post worthy. I’ll post a summary of this month’s meals shortly. While rooting around in the depths, I ran across a clam-shell of blueberries, bought on sale a couple of months ago, and debated on lemon blueberry pound cake or muffins. 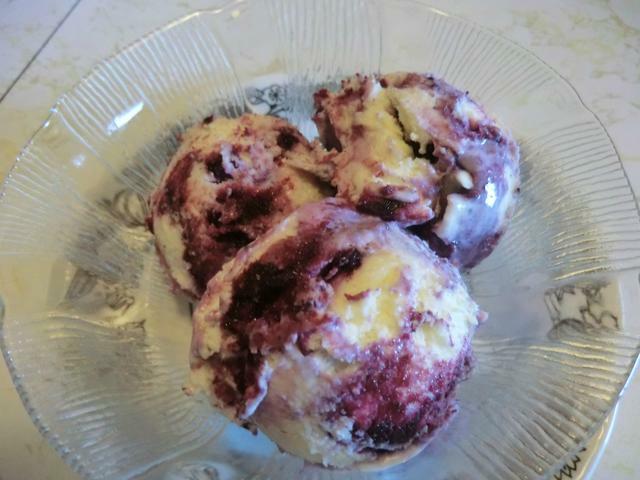 I went with a no-churn blueberry cheesecake ice cream. The sweetened condensed milk (bought during the Xmas baking sales), along with the heavy whipping cream, will also help to clear out the fridge and pantry. ETA: Sorry for the ‘not pretty’ picture below. I kept meaning to take a nicer one and then just devoured the rest of the ice cream without taking a single picture. (OOPS!! Combine the blueberries, sugar, and lemon juice in a pan over medium-high heat. Cook until the berries burst and release juices. You can crush some of the berries with your spoon or spatula to release more juices. Let the berry mixture simmer for a few minutes, until the mixture thickens. Remove the pan from the heat, pour into a bowl, and stick your bowl in the fridge to chill. 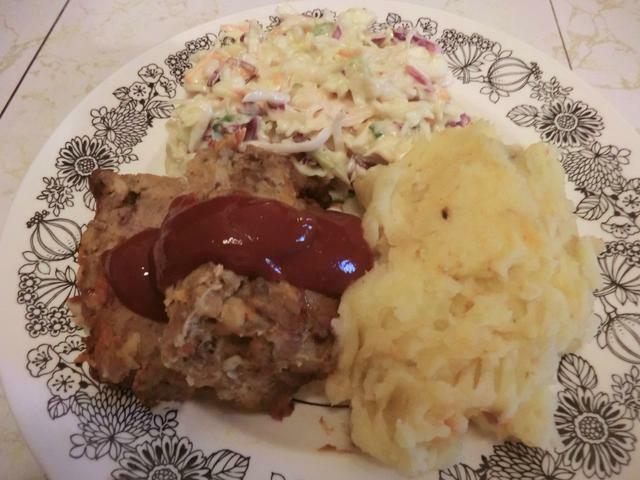 This is a good make ahead and the leftover ‘sauce’ makes a good topping for ice cream or pancakes. 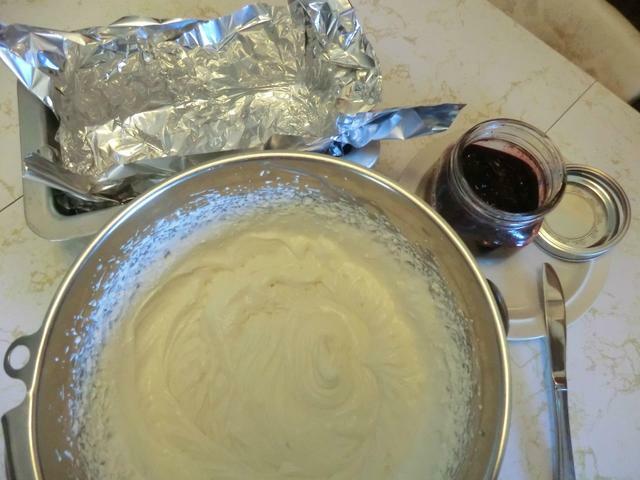 In a VERY large bowl, beat your cream cheese with an electric mixer fitted with whisk/beater attachments until smooth. Slowly add condensed milk and vanilla, and whisk the mixture until smooth. Add the heavy cream and keep whisking until stiff peaks form. (This will take longer than usual due to the other ingredients. About 10 minutes is my estimate.) 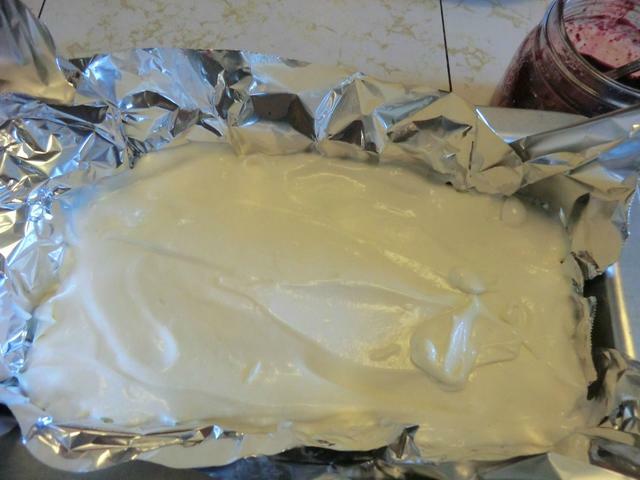 Spoon about half of your whipped cream mixture into a standard sized loaf pan. 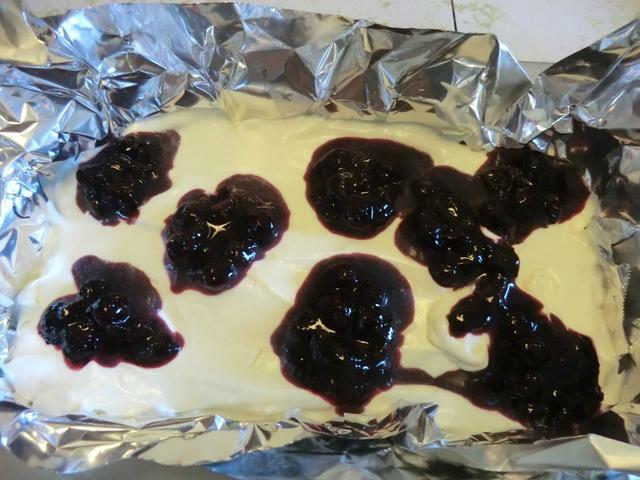 Remove your chilled berry sauce from the fridge and spoon about half of it over your whipped cream mixture in the loaf pan. Blobs of sauce work. Don’t worry about making it pretty. Cover with your remaining whipped cream mixture, and top with the rest of the berry mixture. 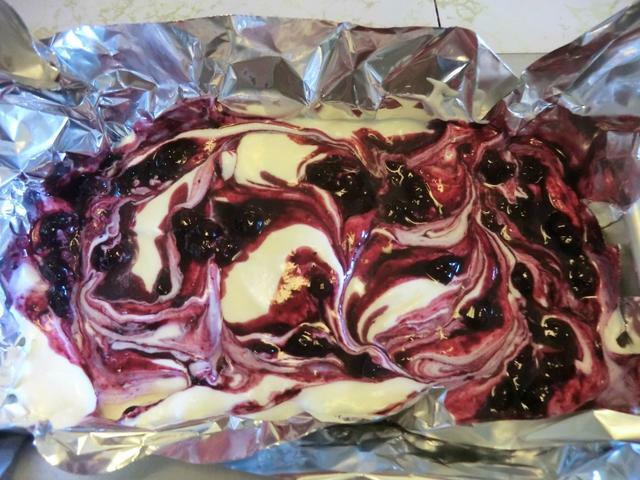 Use a butter knife to drag/swirl your blueberry mixture into your cream mixture. Cover the pan tightly with aluminum foil, and stick it in the freezer for about 6 hours, or until ice cream is firm enough to scoop. For a faster set, make the ice cream in 2 containers. 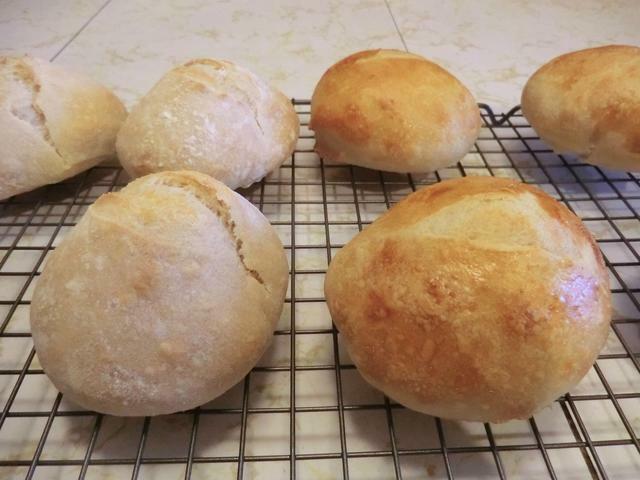 I’ve made soft, fluffy rolls and buns over the years but recently I got a craving for a hard, crusty version. So I went web surfing. 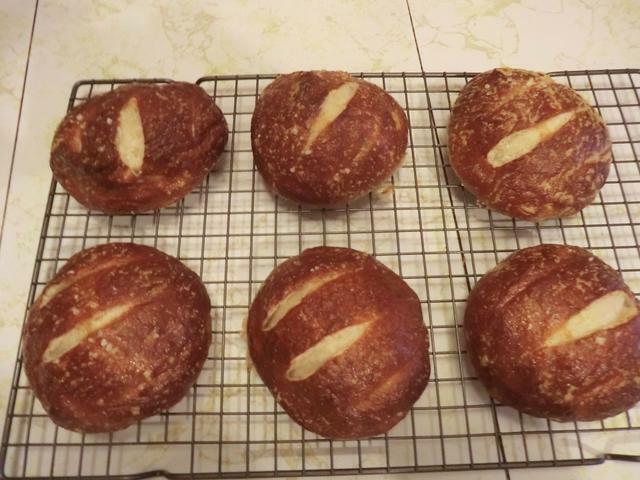 I adapted this King Arthur Flour “European-Style Hard Roll” recipe by substituting my own home made sourdough starter for the starter called for in the recipe. 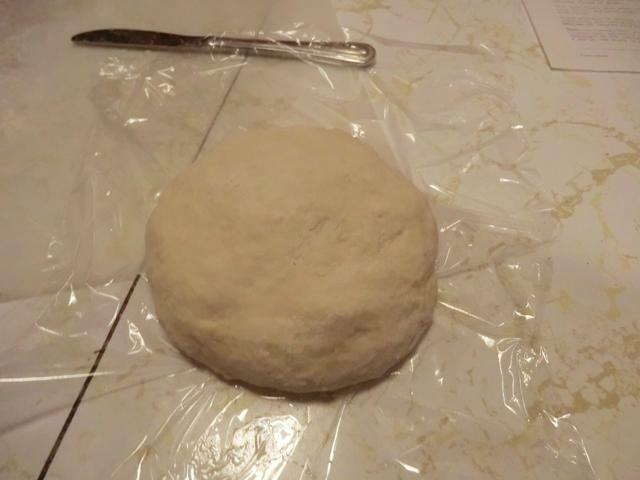 Based on the weight of the flour, water and yeast in the starter, I used a bit over 8 oz/225 gm of sourdough starter. 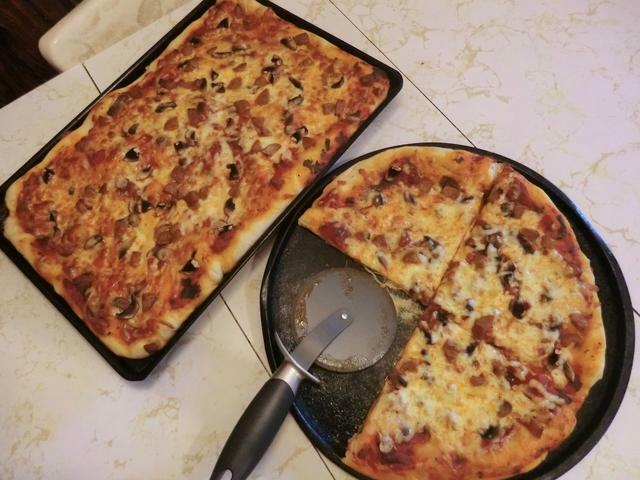 After the initial 3 hr deflate and turns called for, I divided the dough in half (14 oz/400 gm each) and refrigerated one portion in a covered bowl until the next day. 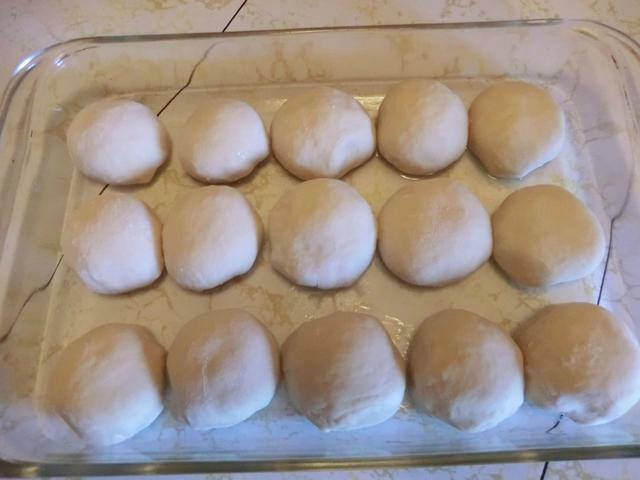 I divided the rest of the dough into 4 portions and shaped the dough into balls, which I proofed for 1 hr before baking at 425 deg F in a preheated oven. I placed several ice cubes into a metal pie pan which I put into the oven to give me a steamy baking environment. 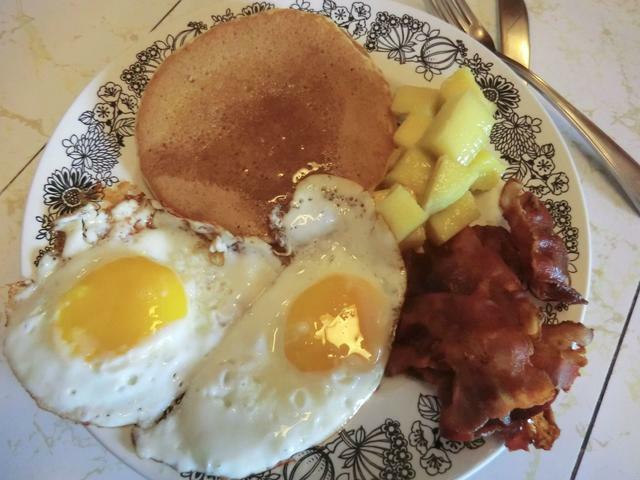 Because I was too cheap frugal to crack an egg for the egg white glaze, I just threw some all purpose flour over the proofed balls and slashed the tops. 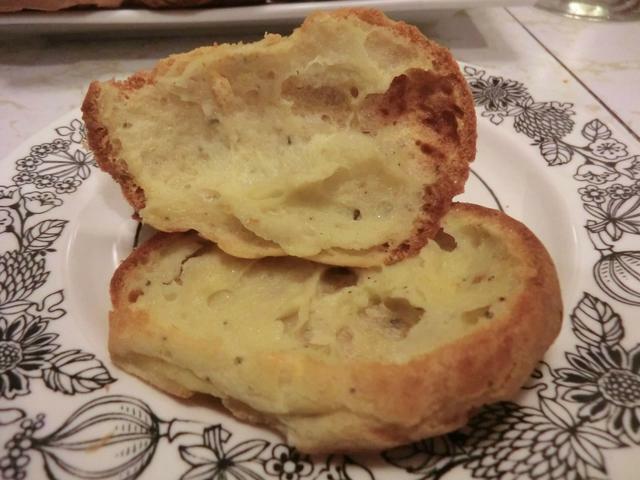 Remarkably, the relatively flat proofed dough balls rose magnificently. 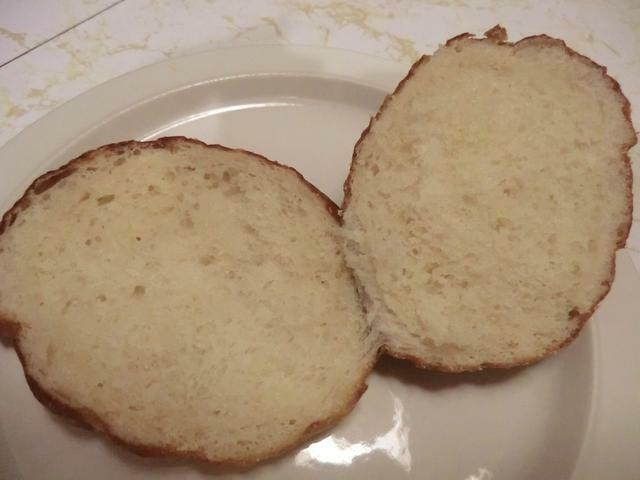 After waiting impatiently about 20 minutes for the rolls to cool, I sliced one open. The crust was, as desired, very hard and crunchy, the texture was chewy and the taste was good. 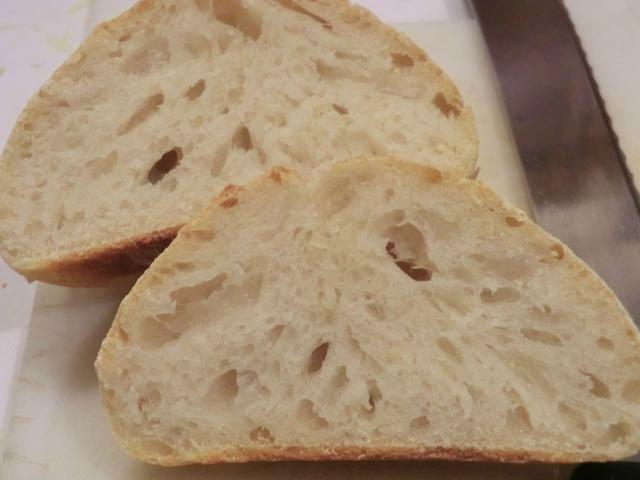 The crumb was fairly open so I’m guessing the hydration level was about 60%. The roll was delicious on its own or dipped into extra virgin oil dressed with freshly ground black pepper and coarse sea salt. The 2nd half of the dough was pulled out of the refrigerator the next day and allowed to come to room temperature … about 2 hrs. 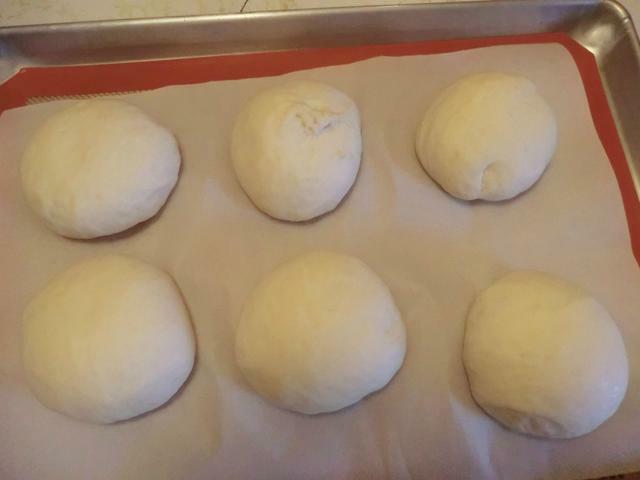 At this point, I shaped the dough into 4 rolls and let them proof for 2 hrs before baking. This time, in hopes of a nicer coloured external crust, I DID use an egg white glaze. 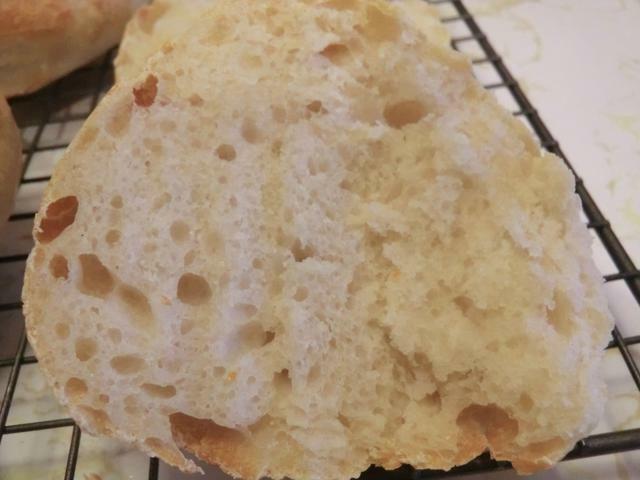 The crust wasn’t nearly as crunchy as the earlier bake but the texture and taste was similar. The colour was beautiful after 25 min of baking. 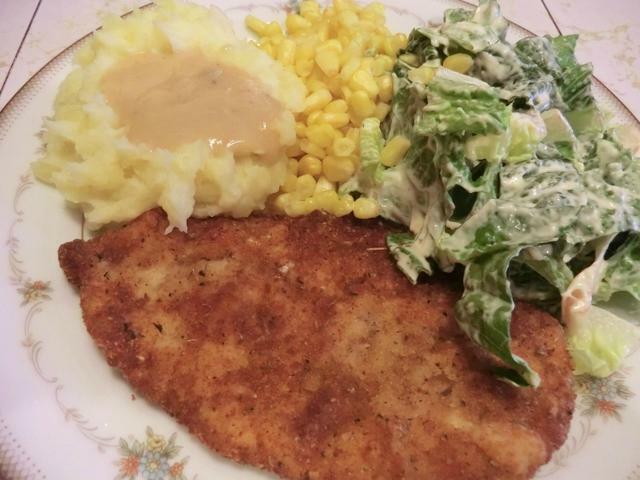 There were a few dishes that my mother rarely, or never, made when I was growing up. Pierogies were one of them. 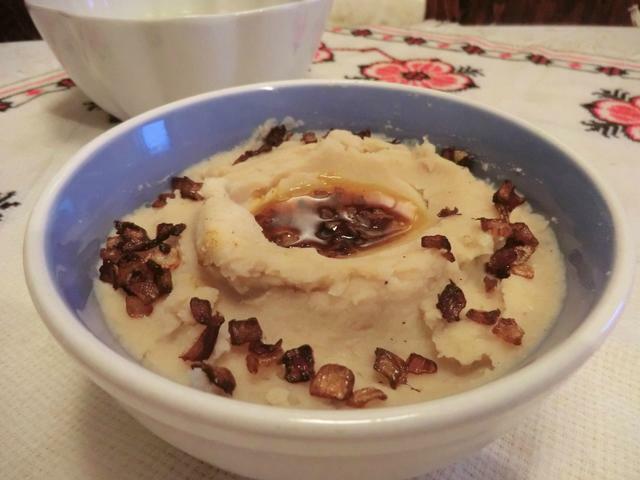 Oh, she’d make the occasional Romanian “Gomboti cu prune” which my SIL identified as “Szilvas Gomboc” (Hungarian Plum Dumplings) for us, but I never remember eating the savoury version. 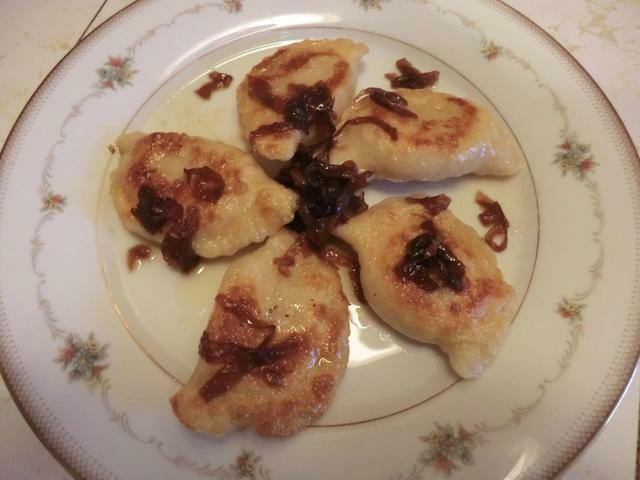 I always thought they’d be a huge amount of work so, over the years, I’ve bought the bags of frozen pierogies from the grocery store and boiled and pan fried them at home with diced onions, and served them with a heaping spoonful of sour cream. 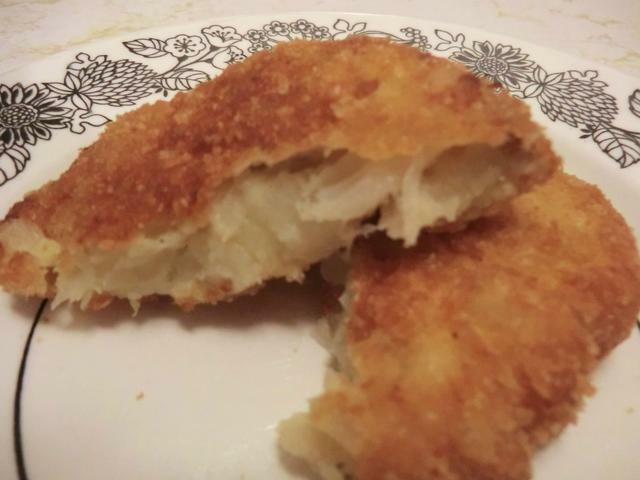 I used a potato, caramelized onion and cream cheese filling … cause I had caramelized onions and the cream cheese in the fridge. I don’t know when/if I’ll make them again, though I DO want to make gomboti, the next time I find some plums at the grocery store. I think my mom used sour plums but it’s been a long time since I last had them so I’ll use whatever’s available. 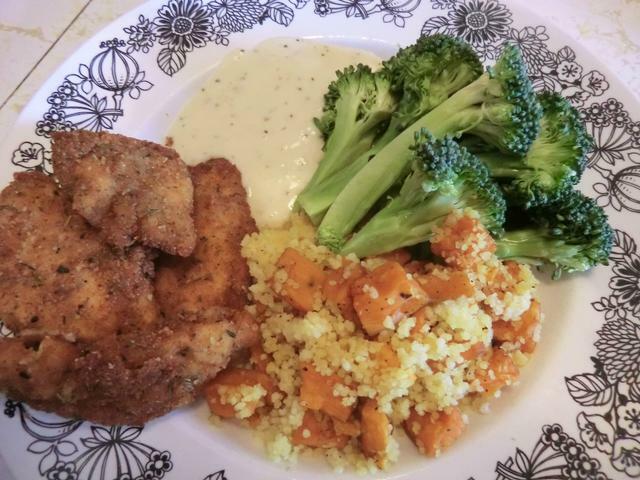 The recipe is a somewhat rewritten version of one I found on Youtube. 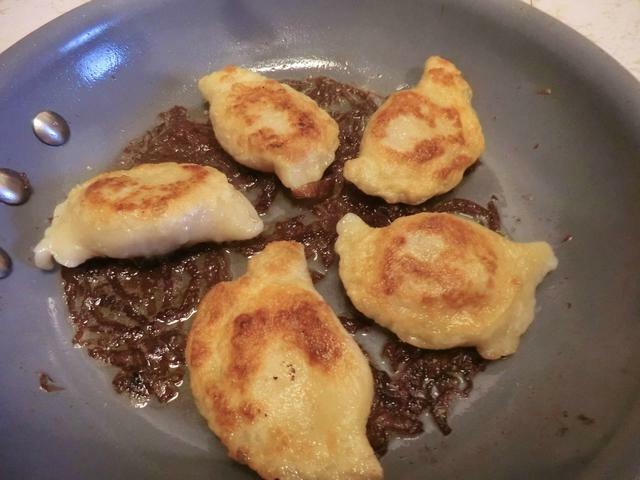 They were called “Polish Pierogies” so that’s what I’m titling this post. 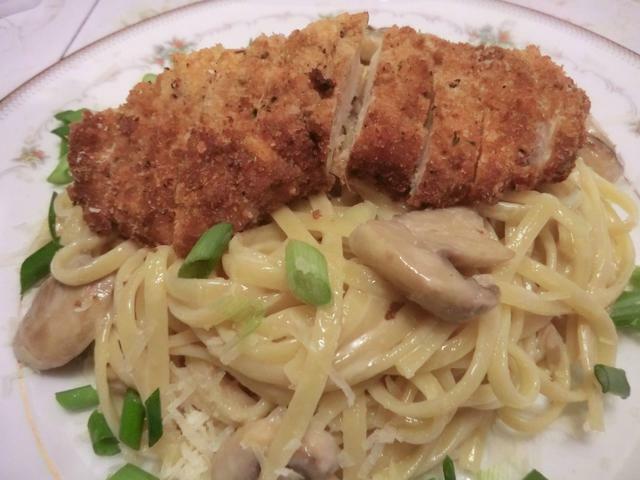 ** I used about 1/4 cup of caramelized onions and the garlic powder, because I was too lazy to fry just the garlic. 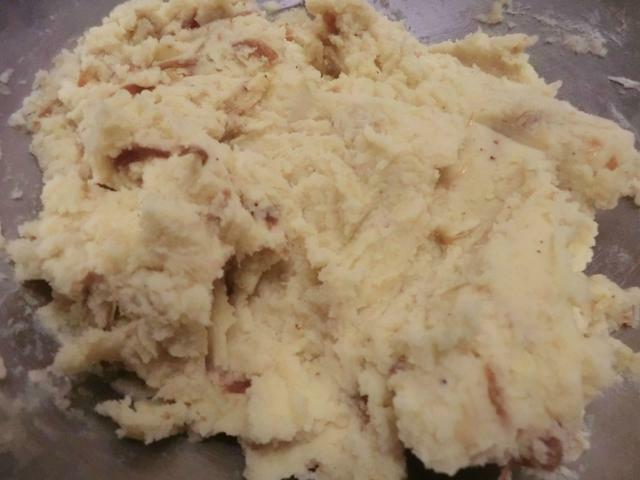 Place peeled, quartered potatoes in a pot of cold salted water. Bring to a boil and cook until fork tender. Meantime, brown onions & garlic in oil on med-low for 10 min. Set aside to cool. 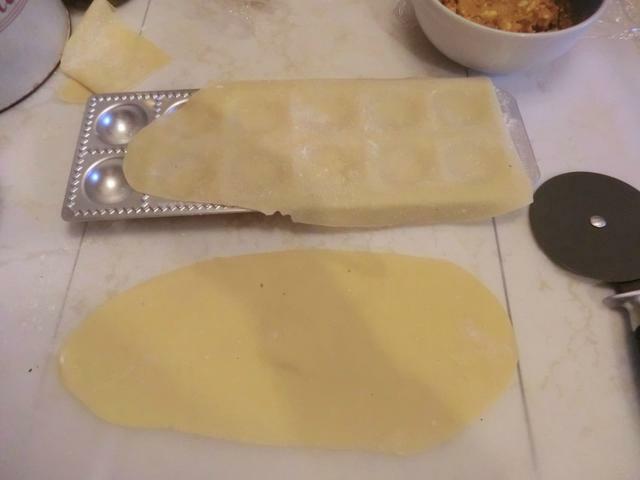 Shape into 1-tablespoon size mounds if desired for convenient portioning and to make the filling process go more quickly. 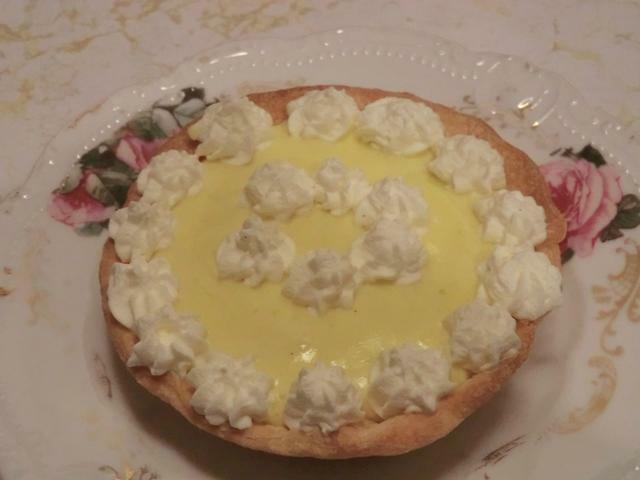 NOTE: I ‘quartered’ the amount of filling I had in the bowl by eye, and then scored the top of the filling with a knife. 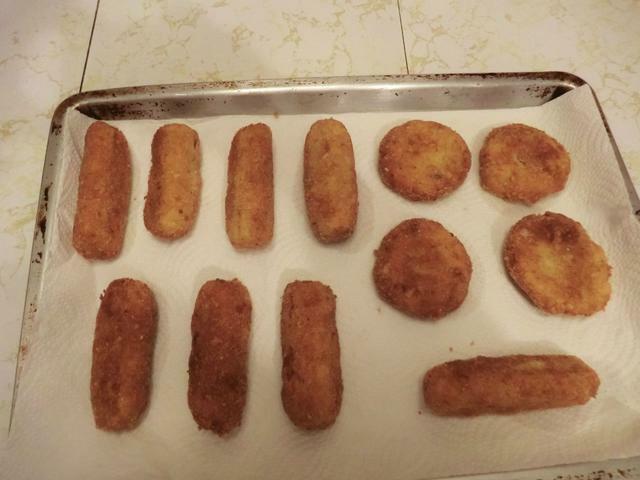 I took out the filling, a quarter at a time and rolled each quarter into a log, which I divided into 6 equal portions. Then I rolled THESE into balls. 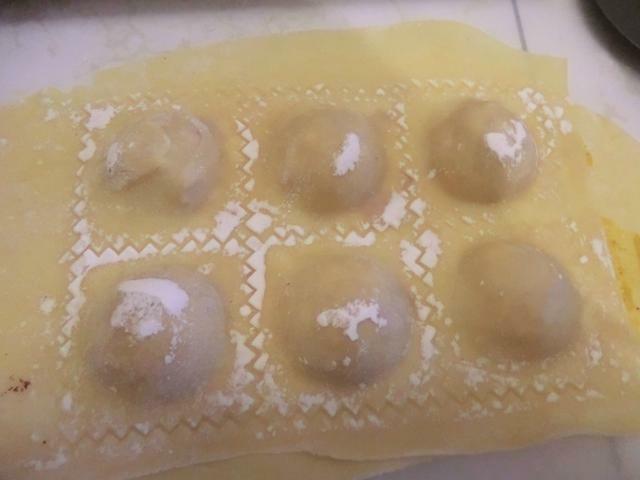 After using up half the filling, I thought the ‘balls’ were too big so on the second half, I divided each quarter of filling into 8ths. 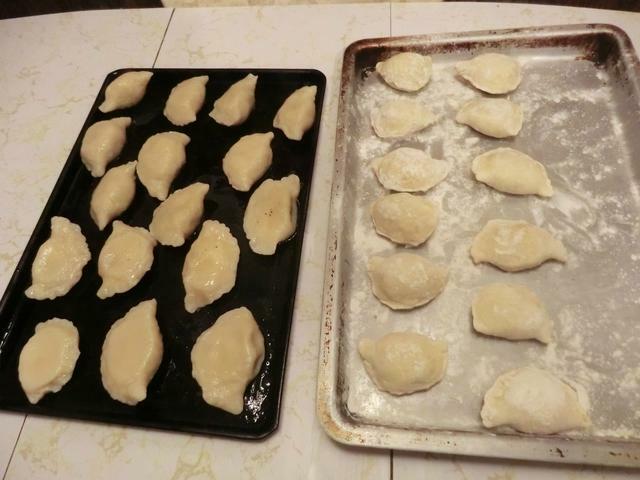 This should give you 32 generously filled pierogies rather than 24 overstuffed ones. Combine flour & salt in a bowl. Make a well and add sour cream, egg and water, combining with a fork or metal spoon. Place on a well-floured board and knead for 50 turns (using a scraper if needed) until smooth. Cover with a towel or inverted bowl & let rest at least 10 minutes. 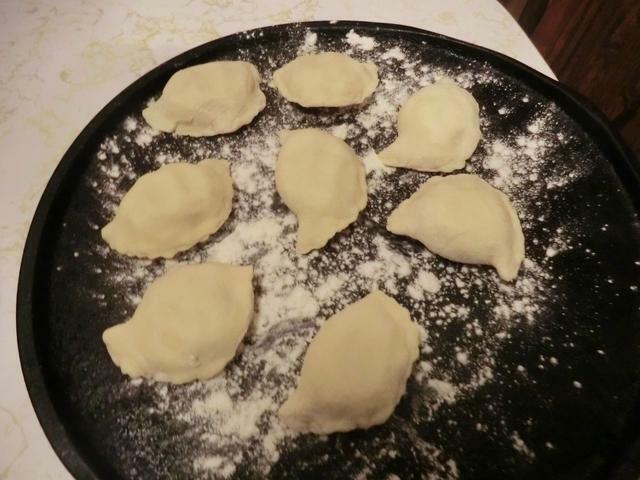 You can wrap the dough in food wrap and refrigerate until the next day, if you need to, though it’s a fast dough to put together the day you make your pierogies so it’s not necessary. Divide the dough into thirds. 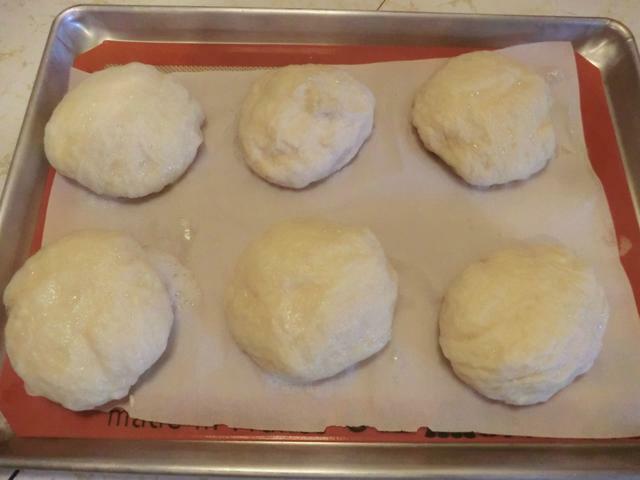 Keeping extra dough covered, roll each section 1/8” thick, adding flour as needed. Cut 3-inch circles, saving leftover scraps of dough. Combine the leftover dough scraps from rolling the three portions for your last portion of filling. Fill each circle with about one tablespoon of potatoes or your filling ‘balls’, fold into a half circle, and pinch edges tightly. Place apart on a towel or baking sheet sprinkled with flour. Place the pierogies in boiling salted water, stirring at first (with the handle of a wooden spoon so as not to pierce the pierogies) to keep them separated, and cook about 3 minutes until they rise to the top, then another 30 seconds to a minute. Remove to an oiled baking sheet. Drizzle some more oil over the top of the pierogies so they don’t dry out. 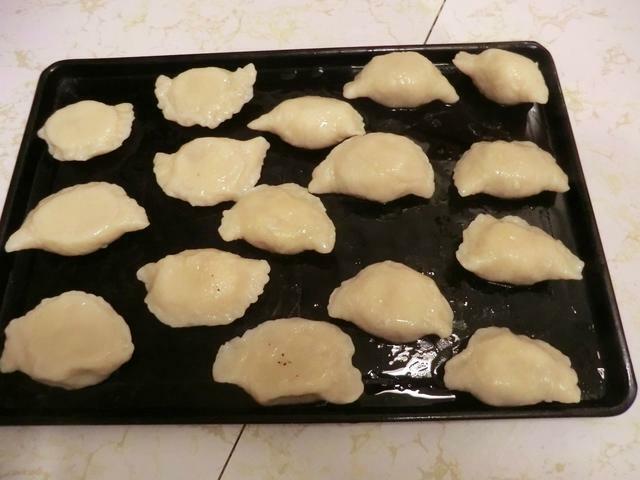 You may also freeze your unboiled pierogies on the floured sheet and then place them in freezer bags. Saute your boiled pierogies in a pan with butter or olive oil until they’re golden and serve with caramelized onions and sour cream for a delicious treat. You can also bake them on an oiled baking sheet in a 350 deg. F oven until lightly golden. 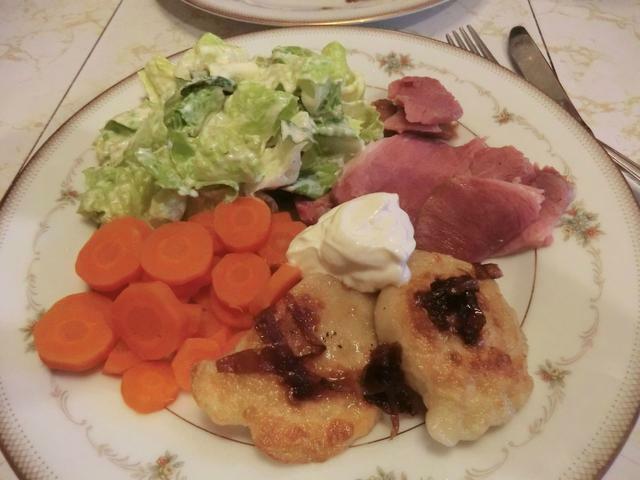 A beautiful accompaniment to a simple boiled ham dinner. I thought I’d share the recipes for these two dishes from my Christmas eve day menu, in case anyone is interested in making them. **NOTE: You can use raw onion and garlic but the texture of the dip will be smoother and the taste milder if you saute them first. 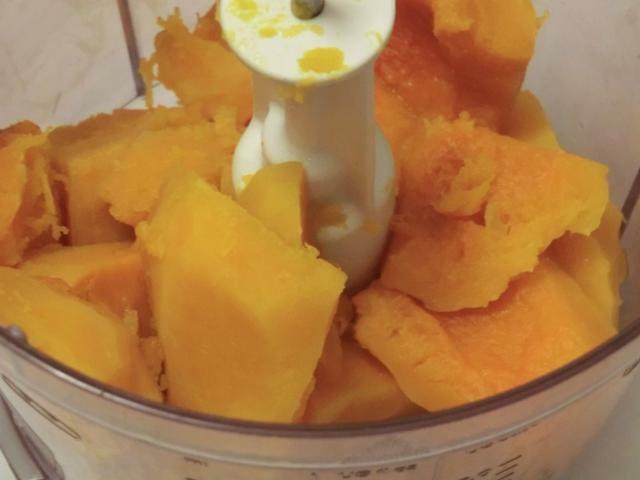 In a food processor combine the above and puree until smooth. Scrape down the sides a couple of time, taste for additional seasoning and liquid. If making with warm beans and liquid, remember the dip will thicken as it cools so you may want to add a splash more water. 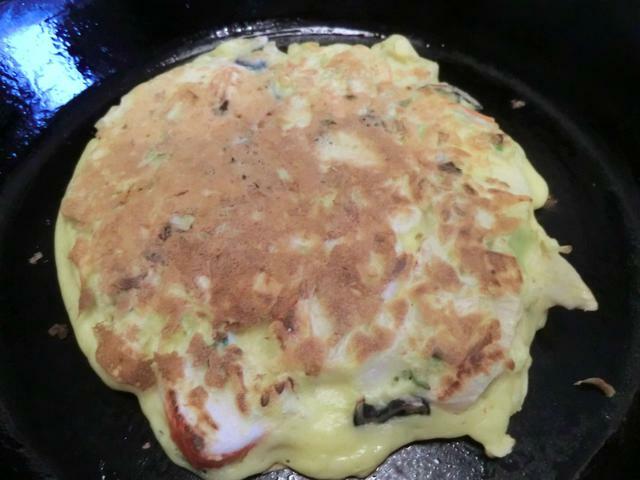 Optional Garnish: 1/4 cup finely diced white onion sauteed slowly in 2 tbsp vegetable oil until golden brown in a small frying pan over medium heat. Remove the onion to a small bowl and add 1/4 tsp Hungarian paprika to the oil. Cook for a minute or so to toast the paprika. Form a shallow circle in the middle of your bowl of bean dip with the back of a large soup spoon. 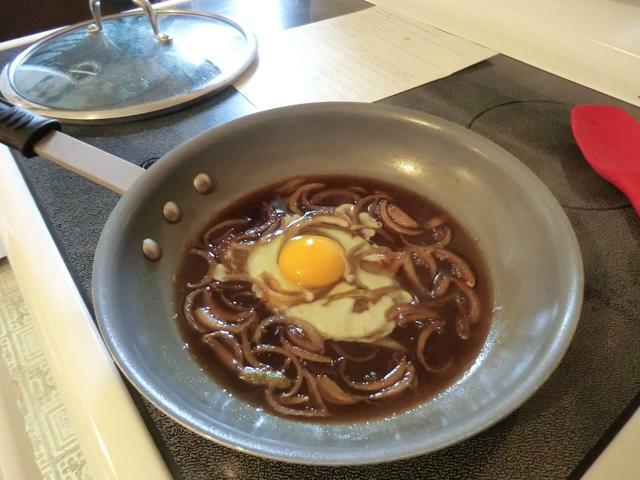 Spoon the paprika flavoured oil into the circle and sprinkle the browned onion over the top. 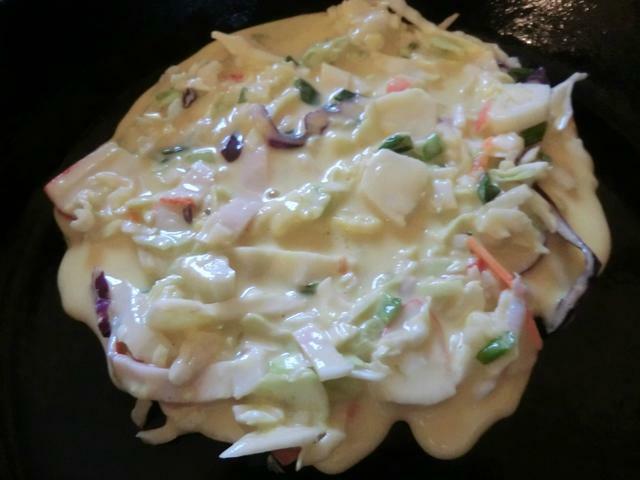 Serve with crackers, pita bread wedges, warm buns or vegetable sticks. The night before, soak the cod in a large bowl of cold water replacing the water a couple of times. Keep refrigerated. Taste a bit of the cod after 12 hrs and if it’s too salty, continue soaking. Otherwise, drain the cod, flake or coarsely chop and refrigerate until needed. 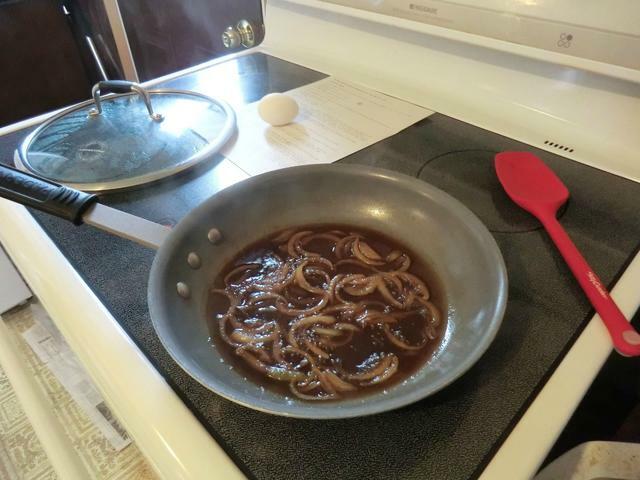 In a small frying pan, saute the onion and garlic in the vegetable oil until translucent and lightly browned. Transfer the onion and garlic to a plate covered with a doubled piece of paper towel to drain off the excess oil. Place cubed potatoes in a saucepan filled with salted water, bring to a boil, cover and cook for 10-15 minutes or until the potatoes are fork tender. Drain the potatoes, return the saucepan back to the heat over medium heat and cook, stirring for 1 minute, to help dry out the potatoes. 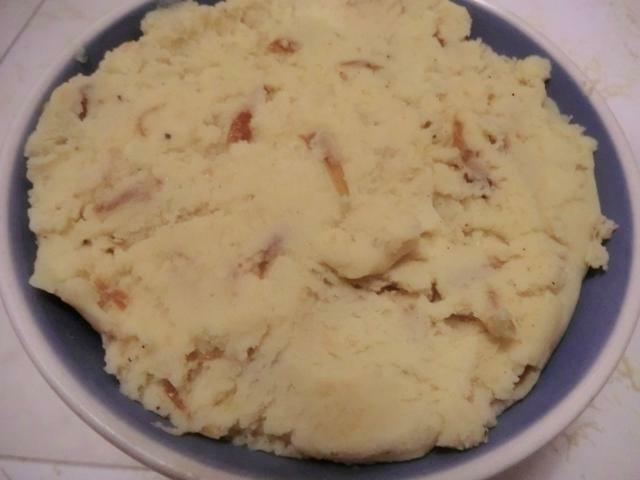 Transfer the potatoes to a large bowl and mash. 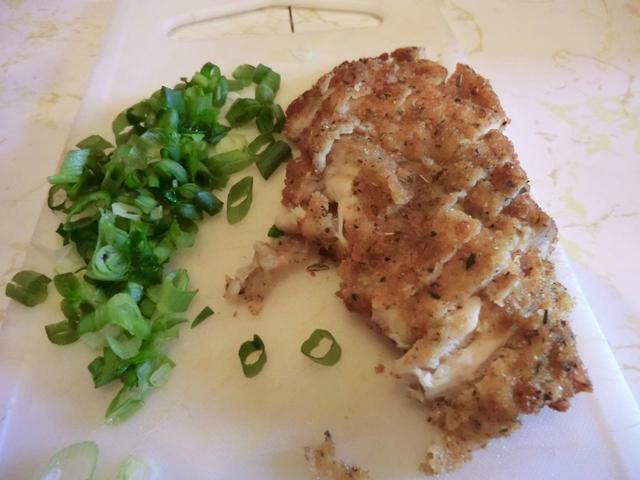 Add flaked cod, sauteed onion and garlic, thyme, salt and pepper and 1/2 cup of the flour and stir well to combine. Using 1/4 cup portions, form into 3 inch long logs or 3 inch diameter and 1 inch tall patties. Set up a crumbing station with flour, beaten eggs and bread crumbs in 3 separate shallow bowls. Coat the logs or patties and set aside on a clean, dry plate while heating the vegetable oil to 350 deg F in a 9-10 inch cast iron skillet for shallow frying. You’ll want the oil to be about 1 inch deep. Fry the logs/patties, turning once, until golden, 4 to 5 minutes on each side. Drain on paper towels. 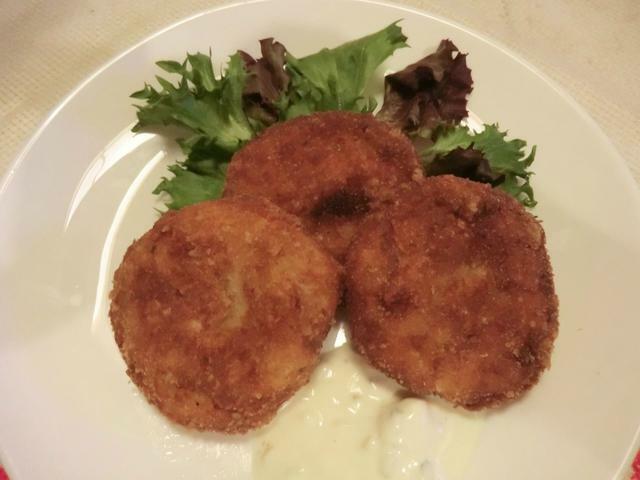 Serve with tartar sauce or ketchup, whatever you prefer. I hadn’t picked up a butternut squash in ages, so when I happened to spot a heap in my grocery store, before Christmas, I brought one home. And then forgot about it until I ran across it while looking for something else. The question was … what to do with it. 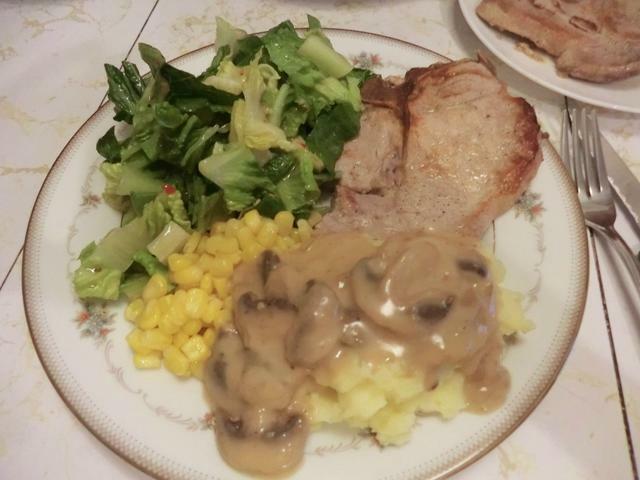 I wanted to be creative but after the Christmas eve day and Christmas day meal preparation, I didn’t want to get TOO complicated. Wash off the outside, cut into half. 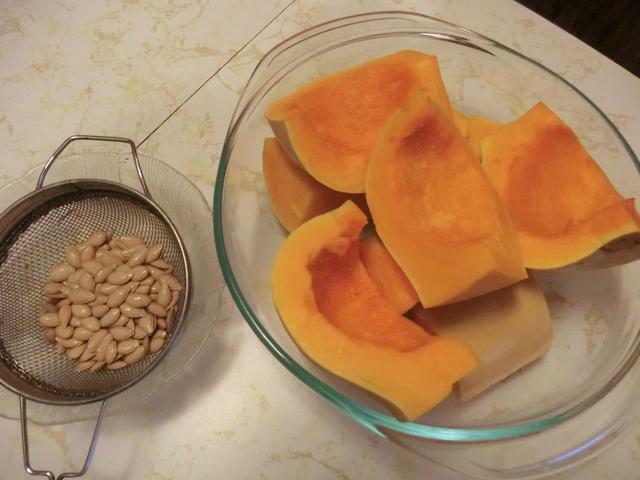 Scoop out the seeds and then cut each half into quarters. Place in a microwave safe bowl with about 1/4 cup of water and microwave on high for 5 minutes at a time until tender. (15-20 minutes should do it.) Peel and then puree. 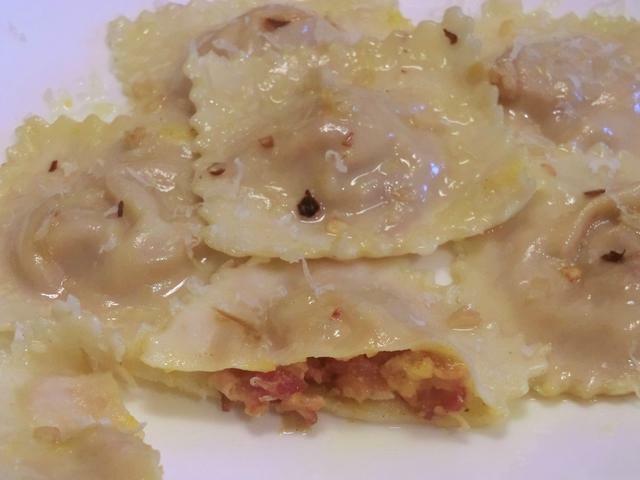 I turned part of the pureed squash into a filling for home made ravioli. Knead the dough for a few minutes, cover with food wrap and let sit on the counter at room temperature for about 20 minutes. Roll out to a thinness of 6 (out of 7) on pasta maker. Mix the above together. Taste and add additional salt and pepper if needed. Fill ravioli and boil for about 2 minutes from fresh. Saute minced garlic clove in extra virgin olive oil until just golden. 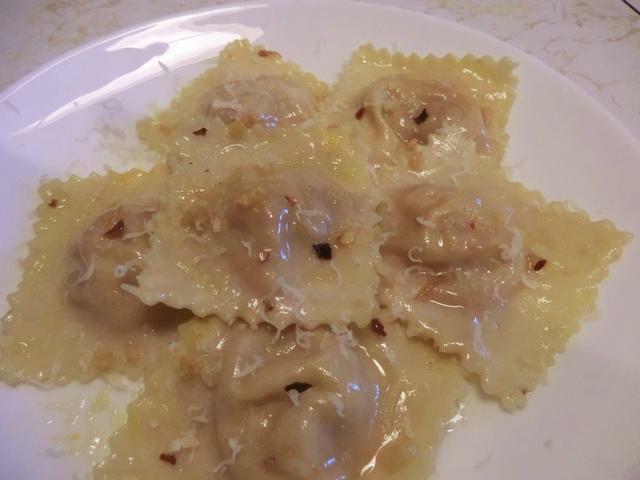 Add cooked ravioli and toss to coat. A pinch of red pepper flakes may be added for a bit of a kick. Serve hot with grated Parmesan cheese. 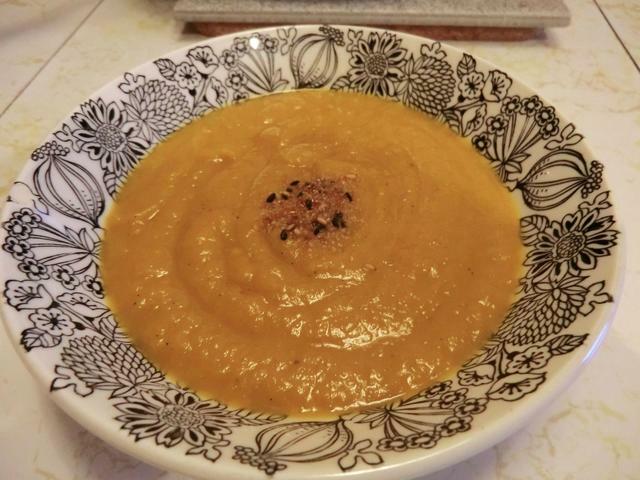 The rest of the pureed butternut squash (~2 cups) became a curried sweet soup with the addition of some leftover poached pears. In a large saute pan, fry the ginger, garlic and caramelized onion in butter, over medium heat until the garlic is translucent. Add curry and cumin powder and fry for about 1 minute more. Add 2 cups of stock, sweet potato, pear and butternut squash puree. Simmer for about 20-25 minutes or until the sweet potato is tender. 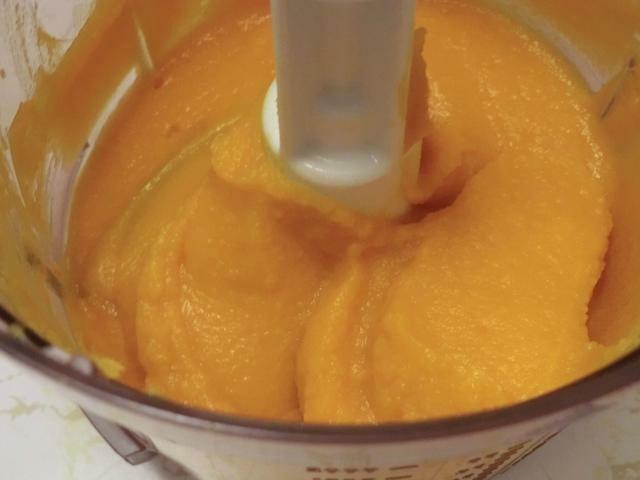 Using a stick or counter blender or food processor, puree the mixture until smooth. Return to saute pan if not using the stick blender and taste, adding salt and pepper to taste. If it’s too thick, whisk in additional stock and warm. Stir in sour cream, if using. I’m sorry but I’ve been a bit distracted and haven’t kept up with my posts this month. 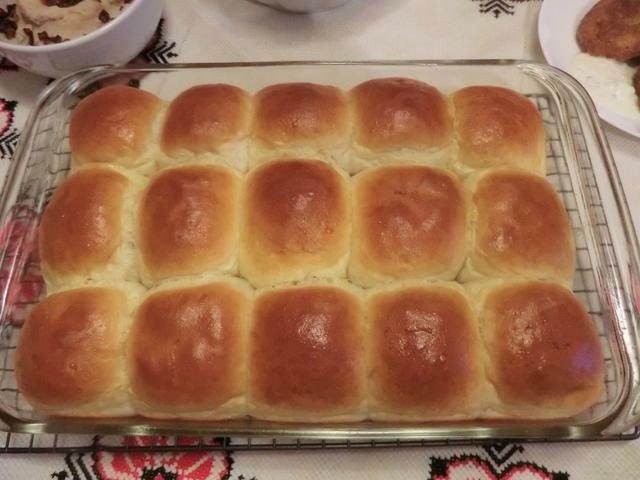 Here are a couple of recipes for buns, 3 for soups and a lot of pictures of meals I’ve made to make you salivate. I hope to do better in 2016. Add the sugar to the warm water and stir until dissolved. Sprinkle the yeast over the top and let it rest for 5-10 minutes (it should be foamy). Put the flour and salt in a medium bowl then pour in the yeast and oil and mix well with a spoon. When it’s well combined, knead the dough with your hands for several minutes. If needed, add more flour. The dough shouldn’t be sticky. Once ready, shape into a ball and brush lightly with oil. 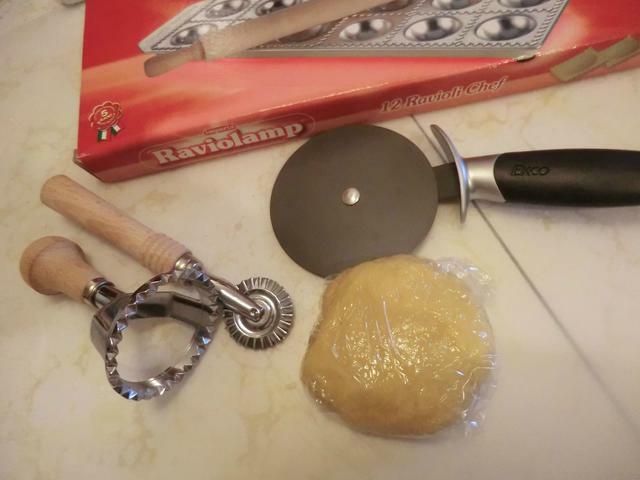 Place the dough in a bowl and cover with plastic wrap and then with a towel. Leave it to rest somewhere warm. This would take about 1 hour. The dough will double in size. 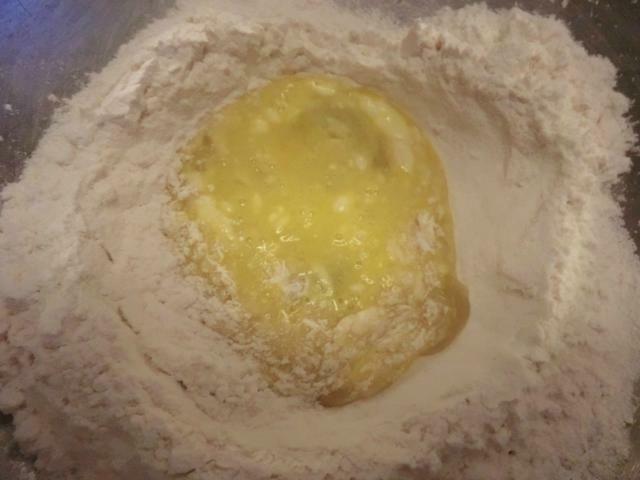 When it’s ready, take it out of the bowl and knead it again a little bit on a lightly floured surface. 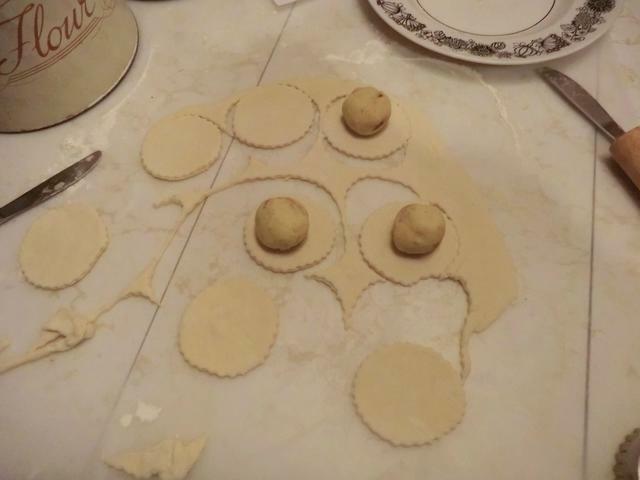 Cut the dough into 6 (or 8) pieces and shape them into balls. Cover the balls with a light towel and leave them to rest. This time for about 30 minutes. 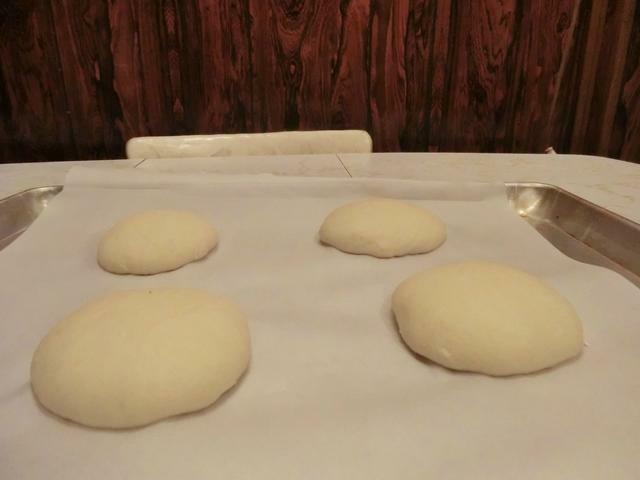 Now it’s time for the part that will give these buns their appetizing crust. First, prepare a baking sheet covered with parchment paper. 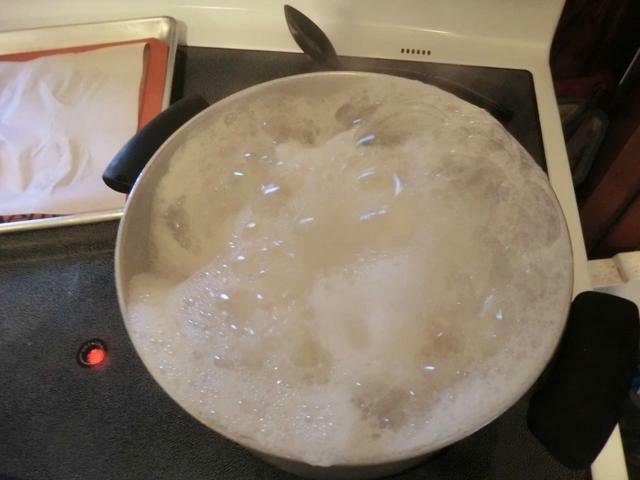 In a large saucepan, bring 1 1/2 liters (6 cups) of water to a boil. Remove from the heat and add the baking soda little by little (it’s going to foam, so don’t just dump all of the soda at once, because it will overflow and turn your stove into a mess). Place back on heat. Place 2 or 3 of the buns in the water and poach them for 30-40 seconds on each side. Take them out with a slotted spoon and put them on the baking sheet. Preheat the oven to 200 deg C (395-400 deg F). 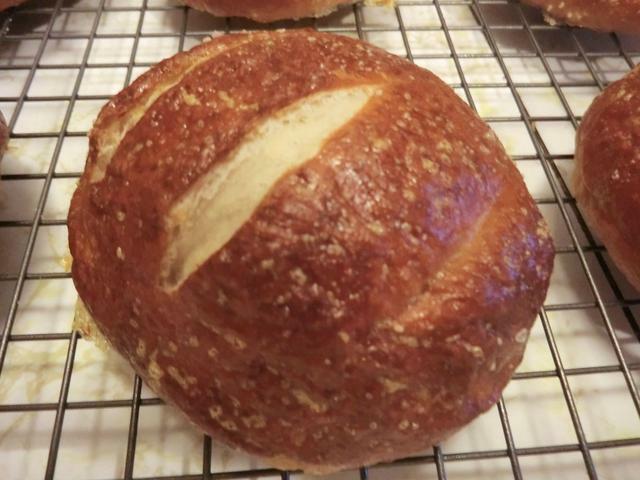 Brush the buns with the beaten egg, sprinkle some sea salt (or pretzel salt, if you have). 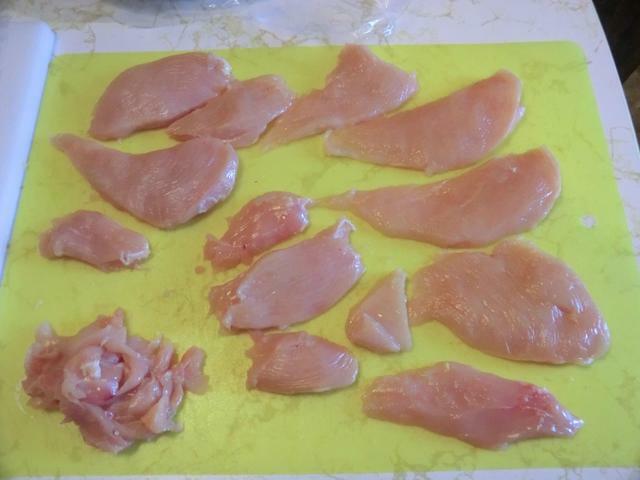 Make several cuts on top of them with a sharp knife. 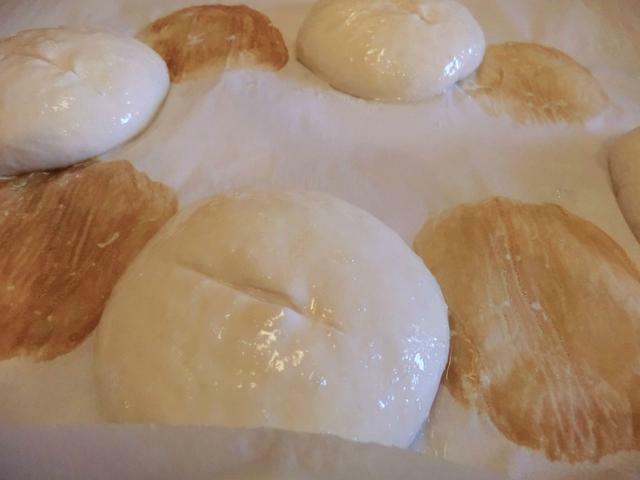 Bake the buns for about 15-20 minutes or until they’re a nice brown colour. Let cool for 5 minutes on the baking pan and then transfer to a cooling rack. 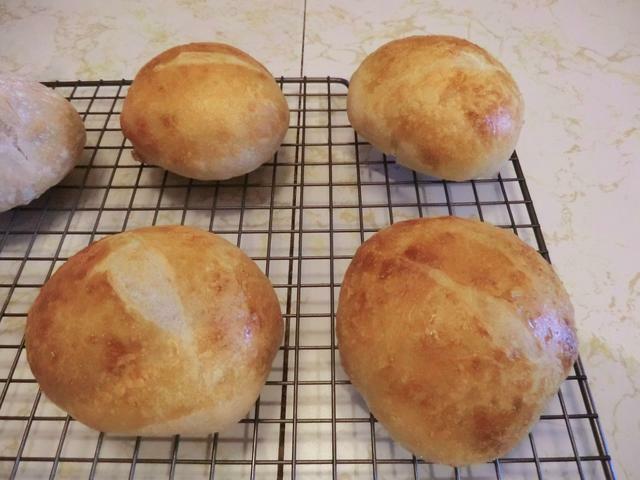 Debra C’s Easy White Bread – makes 1 loaf of bread (in 8″ x 4″, 9″ x 5″ or 13″ Pullman), 2 free form loaves, 15 dinner rolls baked in a 9″ x 13″ pan. Put warm water, yeast and sugar in medium sized bowl and stir until dissolved. Let sit for about 5-10 minutes or until foamy. 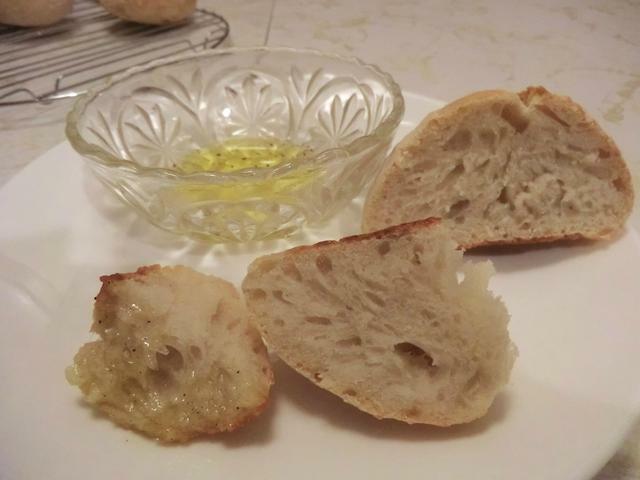 When yeast blooms/bubbles, add salt and oil/butter, stir until salt is dissolved. Start adding flour slowly (1/2 cup at a time) and stir with spoon until you can’t stir any more. 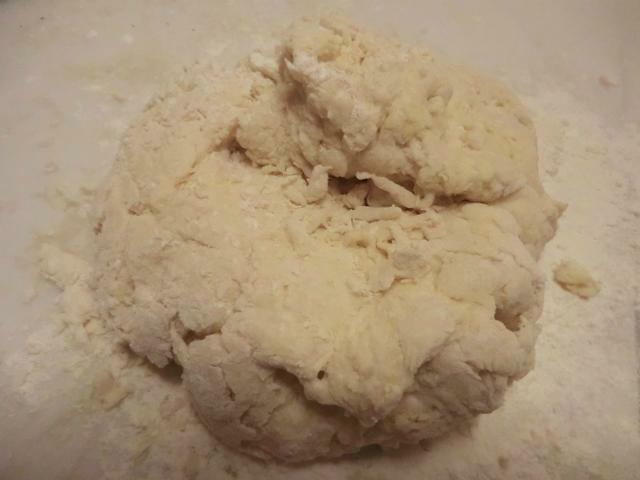 Flour your hands and turn out dough on a lightly floured surface and keep adding flour as you knead. This is going to take several minutes, adding just a bit of flour at a time. 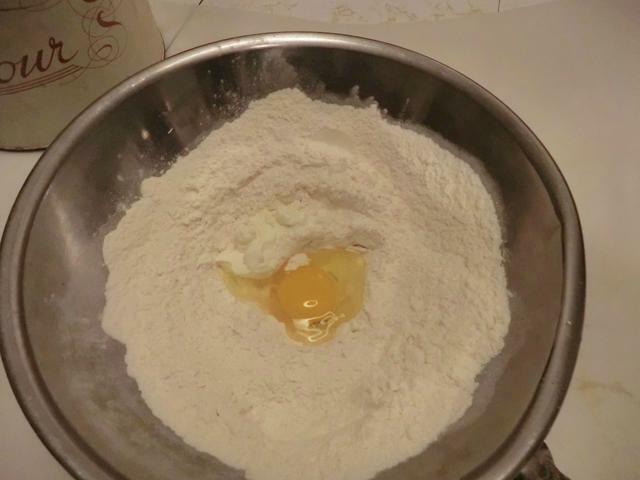 After adding flour just form a ball and cover with your bowl. Let rise 5 minutes in the bowl, covered. Roll out or gently press with your knuckles, until it becomes a rectangle (10″ x 14″). 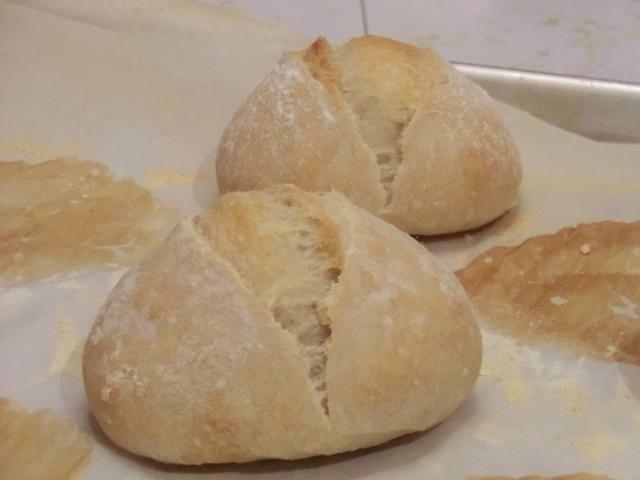 Roll up and place the dough, pinched seam down, into a greased loaf pan. Cover with a towel and let rise 20 minutes or until double in size in a warm place. Preheat the oven to 375 degrees Fahrenheit and cut a slit in the top of the bread. Brush with a little egg glaze or milk. Bake approx. 20-30 minutes until done. 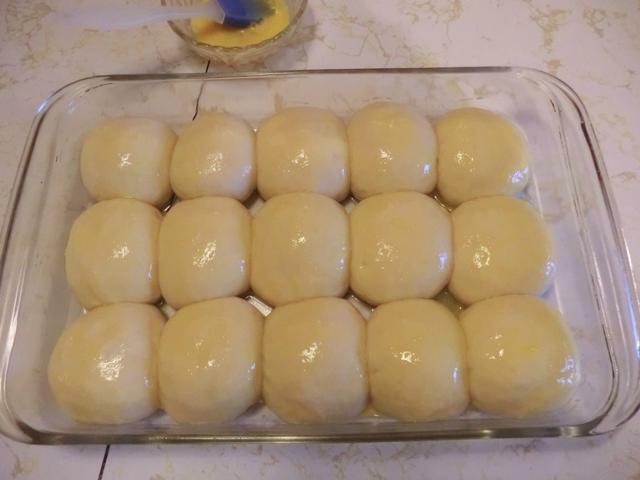 For rolls – Divide into 15 equally sized portions and shape into balls. Place into an oiled 9×13 inch glass or ceramic baking dish and let rise. Brush with egg wash (1 large egg beaten with 1 tsp of cold water) and bake in the preheated oven for about 25 minutes or until golden brown on top. Let rest in dish for about 10 minutes and then remove to cooling rack or the bottoms may get a bit soggy. In a large saute pan over medium-high heat, cook the sausage and onion until the sausage is browned, breaking up as much as possible. Drain out as much of the excess grease as possible. Add in the chicken stock, salt, pepper and diced roasted red peppers (if using), and bring the mixture to a simmer (still over medium-high heat). 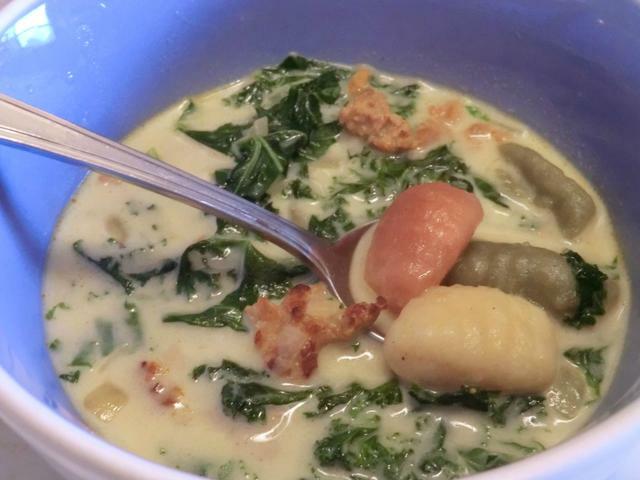 Once it reaches a simmer, reduce heat to medium-low and add the kale and gnocchi and stir to combine. Continue cooking for 5 minutes, or until the gnocchi are cooked through and tender. Stir in the heavy cream. 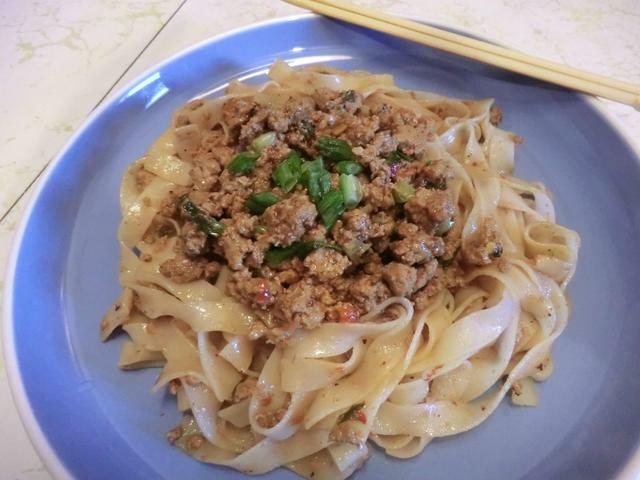 NOTE: If you can’t find hot Italian sausage, use mild and add a sprinkling of crushed, dried red chili pepper flakes. In a large sauce pot, saute the carrots, celery and onion in the butter over medium heat. 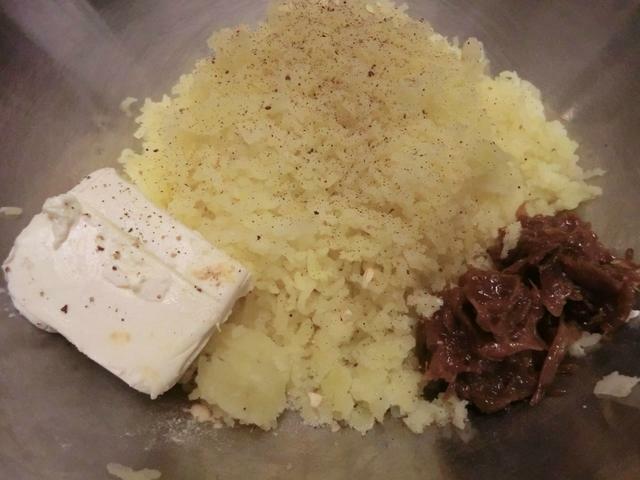 After a few minutes, add the flour, stir into the butter and cook for 3-4 minutes to cook out the rawness in the flour. Stir in the chicken broth a cup at a time until it’s all been added to the pot. Add the corn (if using), onion soup mix (if you didn’t use onion), black pepper, cubed chicken and rice blend. Bring to a boil then cover the pot and reduce the heat until the soup is simmering and cook for 25 min, or until the rice is tender. Whisk in the whipping cream and check the thickness. If too thick, add the additional water. Taste for seasoning. If too salty due to using the dried soup mix, you may wish to add a bit more water. Heat the olive oil in a large saute pan over medium heat. Add the onion and cook until softened, about 5 minutes. Add in the garlic and cook for another minute. Combine 2 cups of the water with the masa harina, whisking until smooth. Pour into the pot along with the remaining cup of water, enchilada sauce, and jalapeno or green chiles. Season with the salt, chile powder, cumin and pepper to taste. Cook for 30-40 minutes, until thickened. 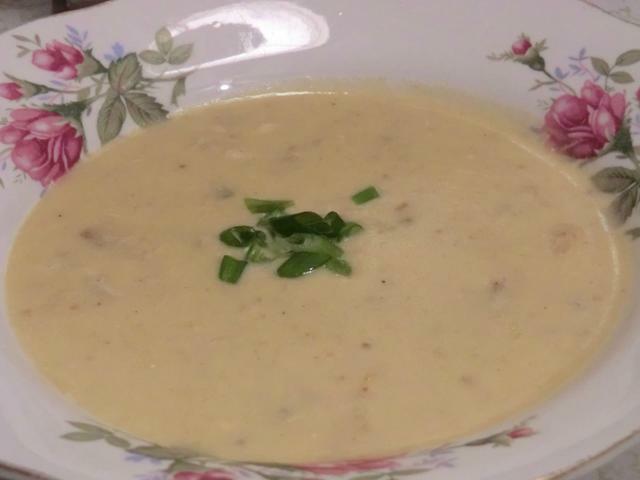 Stir in the Monterey Jack and cream cheese. Cook until the cheese has melted, whisking if needed, 5-10 minutes. Stir in the chicken and cook until heated through. Serve topped with additional Monterey Jack cheese and crumbled tortilla chips, if desired. NOTE: This soup will get thicker upon standing. 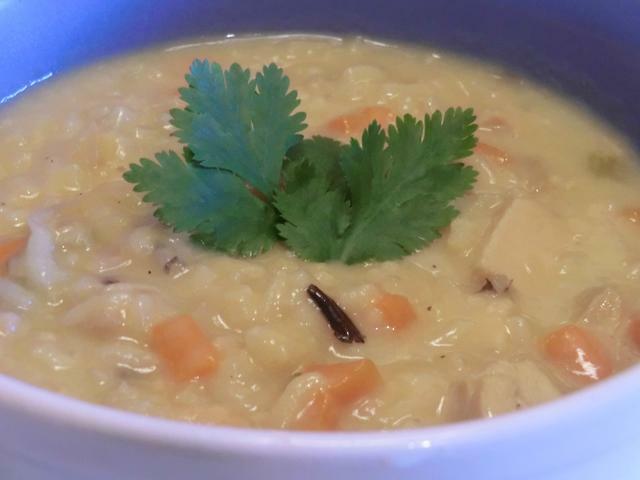 If you like a thinner soup, use more water or chicken broth to thin it out.